Support for the research and writing of this report was provided by the Andrew W. Mellon Foundation, the ARCO Foundation, The Ford Foundation, and the U.S. Department of Labor. Those wishing to print this document may wish to use the PDF version of the report (1.2MB). Please note that the large images have been removed to speed download times. What is the Policy Context? Who Are America's Immigrants and Where Do They Live? What Impact Does Immigration Have on the U.S. Labor Market? What Impact Does Immigration Have on the Public Sector? III. AMERICA'S IMMIGRANTS: WHO ARE THEY AND WHERE DO THEY LIVE? Do Immigrants Depress the Wages of Natives? What Impact Do Immigrants Have on Opportunities for Less-Skilled Workers? Do Immigrants Affect the Wages and Employment of African Americans? What Are the Impacts of Immigration on the Labor Market Opportunities of Immigrants? What Impact Do Undocumented Immigrants Have on Natives' Labor Market Opportunities? VI. IS THE PAST ANY GUIDE TO THE FUTURE? Who are the country's immigrants and where do they live? What is the impact of immigrants on the U.S. labor market? How do the public sector costs of immigrants compare with their tax payments? Chapter I of the report provides an overview for readers exploring immigration issues. Chapter II summarizes the policy context by reviewing the principal substantive areas of immigration and immigrant policy. Chapter III profiles the immigrant population. Chapter IV reports what is known about the labor market effects of immigrants, summarizing the evidence on wage and displacement effects for the population as a whole and for important population groups (low-wage workers, African Americans, and recent immigrants). Chapter V explores the public sector impacts of immigrants. Chapter VI summarizes the themes laid out in the report and highlights several areas of concern for future immigrant integration and immigration policy. A word about sources. The information presented here comes primarily from recent Urban Institute analyses based on the 1990 census, statistics from the Immigration and Naturalization Service (INS), and other relevant sources. To understand fully what is known about labor market effects, the report synthesizes the substantial literature on the topic, written by Institute analysts and other researchers, and pinpoints areas of agreement, disagreement, and continuing ignorance. To elucidate the facts about the public sector impacts of immigrants, the discussion is organized around particular studies that have become so controversial that they themselves are now part of the debate. A word about format. The format of the report is designed to assist the reader in exploring the four key questions we address. Each chapter is self-contained, with summary points, data, and tabular displays to support the findings described in the text. Headings in the page margins guide the reader interested in particular topics. Each of the chapters that follows presents information to provide a common knowledge base to guide public discussion. This chapter summarizes the key questions raised in the report as a guide to thinking about immigration. Immigration policy involves three fundamentally different sets of laws, regulations, and institutions—those that govern legal immigration, those that govern humanitarian admissions (refugees and asylees), and those that control illegal entry. Important distinctions between these separate and distinct domains have frequently been lost in the current debate over immigration policy. U.S. immigration policy is governed by five broad goals: (1) the social goal of family unification, (2) the economic goal of increasing U.S. productivity and standard of living, (3) the cultural goal of promoting diversity, (4) the moral goal of promoting human rights, and (5) the national and economic security goal of preventing illegal immigration. Critiques of immigration often overlook the non-economic goals. The policy context encompasses not just the nation's immigration policies, which determine who comes and in what numbers, but also the nation's immigrant policies (the federal, state, and local policies that influence the integration of immigrants after they have arrived). U.S. immigration policy is set by the federal government and has been both inclusive and well-defined. U.S. immigrant policy, by contrast, is made up of scattered, unlinked provisions and programs that fall, largely by default, to state and local governments. While immigration has been steadily rising, federal support for programs targeted to immigrants, like the Refugee Resettlement Program, has been declining. How current immigration levels are interpreted, compared to the past, depends on the measure used. The absolute number of immigrants a year who enter and stay—currently about 1.1 million (legal and illegal)—matches the previous historical peak. The share of net annual population growth accounted for by immigrants—currently about one-third—is also at its previous historical peak. But the share of the population that is foreign born—currently 8.5 percent—is not much more than half its historical peak. In calculating the impact of immigration on the population, analyses often fail to subtract the number of immigrants who die each year (about 200,000) and the number who leave again (also about 200,000). Taken together, the number of immigrants who die or emigrate each year equals more than one-third of the annual flow of entrants. The most informative measure of illegal immigration for policy is growth in the population that enters and stays. This number is 200,000 to 300,000 a year. The number entering illegally and the number apprehended at the border (each over one million a year) are both misleading measures because they count individuals who enter more than once each time they enter and fail to count those who leave, often within days of their arrival. Less than half of illegal immigrants cross the nation's borders clandestinely. The majority enter legally and overstay their visas. The impact of immigration on the economy and the native-born population is driven not just by absolute numbers but by geographic concentration. The vast majority of immigrants are concentrated in only six states and almost all live in metropolitan areas. The local effects of immigration vary depending on the strength of the local economy, the outmigration of local residents, and the arrival of internal (versus international) migrants from other parts of the United States. The impact of immigration is also driven by its pace and diversity. Almost half the immigrant population arrived within the past 10 years. At the same time, the number of sending countries with at least 100,000 foreign-born residents in the United States rose from 21 in 1970 to 27 in 1980 and 41 in 1990. The perceived failure of the newest group of immigrants to adapt as well as previous waves owes at least in part to their recent arrival. The rapid growth of immigrants who do not speak English well, for example, is a consequence primarily of the size of recent flows and not a change in their propensity to learn English. Immigrant integration increases steadily with length of stay in the United States. The education and income level of recent legal immigrants remained high through the 1980s and did not decline, according to the U.S. census. Studies that report a decline in immigrant income and education levels—often referred to as immigrant "quality"—fail to take into account the fact that U.S. census data do not differentiate by immigration status. Legal immigrants, refugees and illegal immigrants are all included in U.S. censuses. But refugees and illegal immigrants have tended to be poorer and less educated on average than other immigrants. As a result, census data on the education, skills, and incomes of all immigrants understate immigrant quality when applied to the legal immigrant population. Changing policy with respect to legal immigrants cannot be expected to change the characteristics of illegal immigrants and refugees. 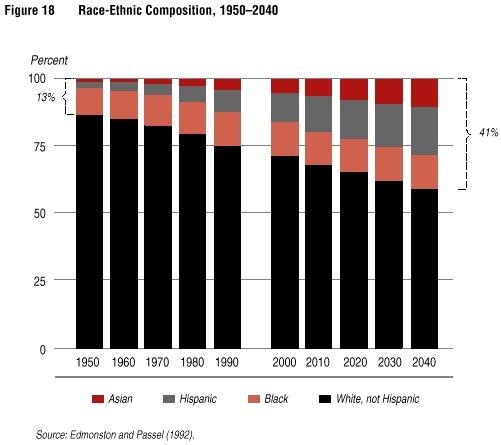 Projections of the future racial composition of the United States must take into account trends in ethnic intermarriage and ethnic self-identification. Different assumptions produce strikingly different racial and ethnic profiles. Understanding the effect of immigration on wages and jobs requires looking both at aggregate data and specific labor markets. Aggregate data show no overall effect. Studies of specific labor markets show small negative effects on low-skilled workers in stagnant local economies with high concentrations of immigrants, but not in other types of economies. The impact of immigration on the wages and jobs of native-born Americans within a community is likely to vary over time depending on the the local economy. In growing economies, immigration increases the labor market opportunities of low-skilled workers; in declining ones or stagnant economies, immigration diminishes them. Estimates of the labor market effects of immigrants usually fail to account for the job-creating effects of immigrant businesses and spending. Self-employment is higher among immigrants than among native-born Americans. Also, spending by immigrants on food, clothing, housing, and other goods creates jobs. Immigrant incomes in 1989 totaled about $285 billion, representing the same share of total incomes in the U.S. that immigrants represent of the total U.S. population. To understand public assistance use by immigrants one must subdivide by period of entry and legal status. Except for refugees, immigrants who arrived in the past decade receive public assistance at significantly lower rates than native-born Americans. Moreover, when refugees are excluded, immigrant use of public benefits actually decreased during the 1980s. Welfare use among working-age (15 to 64 years), non-refugee immigrants is very low. Most transfer payments going to immigrants consist of Supplemental Security Income (SSI) for elderly immigrants. The public sector costs and benefits of immigrants vary by level of government. To the federal government immigrants represent a net gain. Their state-level impact varies by state. At the local level the costs of immigrants—and of the native-born—exceed taxes paid. The major "cost" of immigrants is education of immigrant children. Estimating tax revenues from immigrants requires a dynamic picture that includes all immigrants, not just recent arrivals. Incomes earned and taxes paid both rise with length of time in the United States. The average household incomes of both legal immigrants and refugees who entered before 1980 are higher than natives. Overall, annual taxes paid by immigrants to all levels of governments more than offset the costs of services received, generating a net annual surplus of $25 billion to $30 billion. Immigration policy, which is set by the federal government, determines who enters the United States and in what numbers. This is in sharp contrast to immigrant policy, which is largely left to states and localities and governs how immigrants are integrated into the U.S. economy and society. This chapter outlines the principal goals of U.S. immigration policy and the differences between immigration and immigrant policy. Immigration policy in the United States has, from the start, been shaped by contending forces advocating that the nation should serve as a refuge for the world's dispossessed and those who believe that immigration policy should seek to sift the wheat from the chaff—to admit the immigrants who add to the U.S. economy and society and exclude those who may become a burden. The fundamental tension is evident throughout the evolution of immigration policy in the United States. While many of the core elements of our immigration policies were adopted in the colonial era (such as the exclusion of poverty-stricken migrants likely to become public charges), comprehensive, congressionally enacted immigration policies did not emerge until the end of the 19th century. The first broad modern assertion of the federal regulatory power in the immigration area was the Chinese Exclusion Act of 1882. (See page 11 for a chronological list of major legislative milestones.) Chinese immigrants had been imported to work during the labor shortages of the 1840s, but became increasingly reviled during the recessionary times of the 1870s. In response to popular pressure, the Chinese Exclusion Act suspended immigration of Chinese laborers for 10 years, removed the rights of Chinese entrants to be naturalized, and provided for the deportation of Chinese in the United States illegally. It was not until 1943 that the Chinese exclusion laws were repealed. From 1882 until 1924 national immigration policy focused on excluding persons on qualitative grounds—prohibiting the entry of criminals, prostitutes, the physically and mentally ill, those likely to become paupers and, beginning in 1917, immigrants who were illiterate. National origin exclusions were expanded to Japanese in 1907 and all Asians in 1917. The first general, permanent quantitative or numerical restriction on immigration was imposed in 1924, when the National Origins Act was passed. The law placed a ceiling of 150,000 per year on European immigration, completely barred Japanese immigration, and provided for the admission of immigrants based on the proportion of national origin groups that were present in the United States according to the census of 1890. Because this census preceded the large-scale immigrations from southern and eastern Europe, this provision represented an explicit effort to ensure that future immigration flows would be largely composed of immigrants from northern and western Europe. The national origins quota system would not be overturned until 1965. The election of President John F. Kennedy marked the beginning of a new, more inclusionary era in U.S. immigration policy. Kennedy, of Irish descent, had written a book, A Nation of Immigrants, that denounced the national origins quota system. With his death, with the power of the civil rights movement growing, and with Lyndon Johnson's landslide election, the Congress enacted the landmark Immigration and Nationality Act Amendments of 1965 (Fuchs and Forbes 1985). The law replaced the national origins quota system with a uniform limit of 20,000 immigrants per country for all countries outside the Western Hemisphere. At the same time, though, the law placed a limit for the first time on immigration from the Western Hemisphere (most notably on Mexico). The law contained within it the seeds of the massive shift away from European immigration that would subsequently occur. It can also be seen as setting the stage for expanding illegal immigration from the Western Hemisphere into the United States. The next major milestones in U.S. immigration policy occurred during the period from 1980 to 1990. During this decade three major pieces of immigration legislation were enacted, each representing, for the most part, a major liberalization of national immigration policy. The decade began with passage of the Refugee Act of 1980. The law was intended to send a clear signal to the world that the nation had adopted an explicit set of policies that committed it to annually receiving a substantial number of refugees. (Previously admissions had been administered in an ad hoc and highly ideological manner.) The law expands the definition of "refugee" beyond those fleeing from communist countries and entitles refugees to certain federally reimbursable social and medical services. Along with the 1965 Act, the Refugee Act's implementation has had the effect of increasing the representation of non-European countries in the immigration flow. Suspends immigration of Chinese laborers for 10 years. Provides for deportation of Chinese illegally in United States. First comprehensive law for national control of immigration. Establishes Bureau of Immigration under Treasury. Directs deportation of aliens unlawfully in country. Imposes first permanent numerical limit on immigration. Establishes the national origins quota system, which resulted in baised admissions favoring northern and western Europeans. Quota for skilled aliens whose services are urgently needed. Establishes 7-category preference system based on family unification and skills. Sets 20,000 per country limit for Eastern Hemisphere. Imposes ceiling on immigration from Western Hemisphere for the first time. Extends 20,000 per country limits to Western hemisphere. Sets up first permanent and systematic procedure for admitting refugees. Removes refugees as a category from preference system. Defines refugee according to international, versus ideological standards. Establishes process of domestic resettlement. Institutes employer sanctions for knowingly hiring illegal aliens. Increases legal immigration ceilings by 40 percent. Triples employment-based immigration, emphasizing skills. Establishes temporary protected status for those in the U.S. jeopardized by armed conflict or natural disasters in their native countries. Sources: Immigration and nationality Act of 1992; Jones 1992; Immigration and Nationalization Serviec 1991, Statistical Yearbook. The Refugee Act was followed by the Immigration Reform and Control Act of 1986 (IRCA) which addresses the issue of illegal immigration. The law introduces penalties for employers who knowingly hire illegal immigrants. At the same time, though, it creates two large programs to grant legal status to illegal immigrants. The decade culminated with the Immigration Act of 1990, which, among other things, revises legal immigration policy. While the law was purportedly a compromise between exclusionary and inclusionary forces, in fact, it represents a major liberalization of legal immigration policy, as total admissions were increased by 40 percent. Much of the increase, though, is allocated to highly skilled immigrants (Fix and Passel 1991). While the contending forces in U.S. immigration policy do not seem to have changed their postures significantly over time, this brief discussion suggests that the pace of immigration policy reform has accelerated. Before 1980, major reform of immigration policy took place every quarter century. Now, less than four years after enactment of the 1990 Immigration Act, immigration policy and its reform are again a central focus of congressional attention. Making policy sense of the widely varying types of action represented in this chronological sketch requires clear separation of three distinct parts of U.S. immigration policy: (1) legal immigration, (2) humanitarian admissions, and (3) illegal immigration. Failure to keep these domains separate may be the most important source of confusion in the current national debate. The distinction is crucial because the three domains are governed by different legislation, administered by different bureaucracies, and involve different administrative functions—functions that range from paramilitary operations to apprehend illegals, to language training to facilitate immigrant integration. The various parts of immigration policy are also motivated by different goals. National and economic security—controlling illegal immigration. The current debate tends to focus on the economic outcomes and neglect the social, cultural, and moral goals. Thus, many critiques of immigration policies ignore the intent of their framers. U.S. admissions policies are, to an extent that is generally under-recognized, the product of the civil rights revolution of the 1960s. That is, they are guided by nondiscriminatory principles which eliminate the racial, national, and ethnic biases that controlled before 1965, when annual quotas that tilted immigration toward Europe were eliminated.4 These principles, coupled with the law's emphasis on family unification, have driven a largely unexpected shift in the composition of new immigration from Europe to Central America and Asia. Legal immigration policy alone pursues the social, economic, and cultural goals noted above. The social goal of family unification is principally intended to unite nuclear families. Strong, sustained support for this goal derives in large part from the fact that its main beneficiaries are U.S. citizens—a politically endowed constituency. The economic goal of meeting the nation's labor force needs requires maneuvering among three potentially conflicting objectives: (1) promoting the nation's competitiveness in the global economy, (2) minimizing the burden placed on employers, and (3) protecting the wages and employment conditions of U.S. workers. The rhetoric of making immigration policy more responsive to the nation's labor force needs was central to the politics of the 1990 Immigration Act, which almost tripled admissions for highly skilled workers and their families, raising the number admitted from 58,000 to 140,000 annually (Fix and Passel 1991). The architects of the 1990 Immigration Act also sought to advance the cultural goal of diversifying immigration to the United States by diluting the degree to which immigration over the previous decade had been dominated by Latin American and Asian admissions. In the 1990 Act, a new "diversity" category was added to bring in immigrants from countries that had sent few immigrants to the U.S. in recent decades. The varied objectives behind this innovation included (1) increasing European immigration, (2) increasing the skills of new entrants, and (3) intensifying the role immigration plays in promoting pluralism within the United States. Include a program for resettling refugees—involving cash, medical support, and social services. The resettlement program recognized that refugees and asylees arrive with little money and no family or business connections. The 1980 Refugee Act covers two types of humanitarian admissions—refugees and asylees. Refugee admissions are set annually by the President in consultation with Congress. Refugee admissions for FY 1994 are expected to total 120,000. While refugees apply for admission to the United States and are processed overseas, asylees petition to remain in the U.S., usually after having entered illegally. Put differently, the U.S. selects refugees; asylum seekers select the United States. Asylum applications reached 147,000 in 1993, up from only 56,000 in 1991; only 4,465 petitions for asylum were approved in fiscal 1993 (National Asylum Study Project 1993). Although asylum was not a central concern of those who framed the Refugee Act, it has become an extremely volatile issue—not just within this country but also across Europe. This concern is due in large part to the fact that asylum is often granted after illegal entry, which puts efforts to offer humanitarian admission in conflict with illegal immigration control. The controversy that has plagued asylum is fed both by the number of applications that have been filed—yielding a current backlog of almost 350,000 unadjucated cases—and by the perception that the system is out of control.6 One explanation advanced for the backlog has been the incentives built into the asylum process. Most asylum applicants have not only been granted work authorization while they await their hearings, they have also been extended broad procedural safeguards if their petitions are denied. Further, few denied applicants have ever been deported. Thus, despite the fact that most asylum applicants come from countries where human rights abuses have been documented, the process has been viewed skeptically by its critics (National Asylum Study Project 1993). Only with passage of the Immigration Reform and Control Act of 1986 (IRCA) did Congress lay out a more or less coherent legislative scheme to control illegal immigration, thereby turning immigration policy to the goals of promoting the nation's sovereignty and protecting the economic security of the U.S. labor force. Before 1986, policy to control illegal immigration consisted mostly of intercepting illegals at the border or apprehending them at their jobs. The 1986 Act changed this by making the hiring of illegal immigrants a civil and, in some cases, a criminal violation. IRCA attempted to strike a balance among five at least partially conflicting objectives: (1) cutting off the work and welfare "magnets" thought to attract illegals; (2) minimizing the regulatory burden on employers; (3) meeting the labor force needs of industries dependent historically on immigrant labor (especially California agriculture); (4) averting discrimination against foreign-looking and -sounding people; and (5) minimizing government intrusion on privacy. In addition to IRCA's employer sanction provisions, the law mandates that states use the Systematic Alien Verification for Entitlements (SAVE) system, an automated verification system to track the immigration status of applicants for welfare. While the "carrot" of IRCA's amnesty provisions has been extremely successful, the "stick" of employer sanctions has largely failed to control illegal immigration in the 1990s. Employer sanctions have proved difficult to enforce because of the increased prevalence of fraudulent documents and the limited resources thus far dedicated to enforcement by the Immigration and Naturalization Service (INS). At the same time, civil liberties principles have been invoked to defeat political initiatives for adopting a national identity card, which further complicated enforcement (Fix 1991). Immigrant policy encompasses the laws, regulations, and programs that influence the integration of immigrants once they are in this country. Its range is broad, including laws and regulations that determine non-citizens' eligibility for public benefits as well as spending on programs that are targeted to immigrants, such as the Refugee Resettlement Program and bilingual education. In sharp contrast to the inclusive and well-defined federal immigration policy described in the previous section, the United States has no coherent immigrant policy, at least at the federal level. Indeed, the already limited federal expenditures devoted to immigrant-related programs have been sharply reduced in recent years—even as the numbers of immigrants have risen steadily. Under the Refugee Resettlement Program, for example, real federal spending per refugee has fallen from $7,300 in FY 1982 to $2,200 in FY 1993. As a consequence, public responsibility for incorporating newcomers has fallen, mostly by default, to state and local governments (Fix and Zimmermann 1993). Thus, the United States has no comprehensive, principle-driven policy for immigrant integration. This lack of an immigrant policy is responsible at least in part for the rising concerns about the costs of immigrants to state and local governments and about the pace of immigrant integration. WHO ARE THEY AND WHERE DO THEY LIVE? The current debate over immigration facts and policy begins with questions about U.S. immigrants. Who are they? What are their origins and characteristics? What are their current socioeconomic impacts? What are their expected future impacts? This section looks at these questions objectively with data from a number of studies. What follows is a largely tabular display of statistics intended to shed light on the controversies surrounding U.S. immigrants, their composition, origins, and socioeconomic impacts. The United States is now experiencing the largest wave of immigrants in the country's history. The first major in-migration began in the late 1840s and peaked in the 1880s, a decade during which somewhat more than 5 million immigrants arrived on U.S. shores (Figure 1). The majority came from northern and western Europe, mainly from the United Kingdom, Ireland, Germany, and Scandinavia, following revolutions, famine, and upheavals in Europe. The next immigration wave peaked in the first decade of this century, when 9 million immigrants entered the country. Southern and central Europe were the main sources of new entrants in this period, as huge numbers of Italians, Poles, and eastern European Jews flocked to the United States. The restrictive legislation of the 1920s and the Great Depression virtually cut off immigration in the period leading up to World War II. Following the war, immigration began to build again and has since increased steadily. Immigration in the 1980s reached almost 10 million, the highest numerical peak in U.S. history. More than 10 million immigrants (legal and illegal) are likely to enter the United States during the 1990s, in part as a result of the 1990 Immigration Act. Most of the immigrants who make up this latest wave come from Latin America and Asia. To put current concerns about the labor market impact of immigrants into historical perspective, it should be noted that immigrants entering the country in the early part of the century had a much greater impact on the U.S. labor market than the numbers entering today. This difference in scale occurs because the U.S. population was only about one-third its current size. In 1907 alone, for example, immigrants added about 3 percent to the U.S. labor force. To have an equivalent labor market impact today, immigration would have to reach at least 9 million per year, 10 times current levels. ABSOLUTE NUMBERS The 1990 census counted 19.7 million foreign-born persons in the United States, 34 percent more than in 1980. By late 1993, the foreign-born population (including naturalized citizens) had probably reached the 22 million mark. 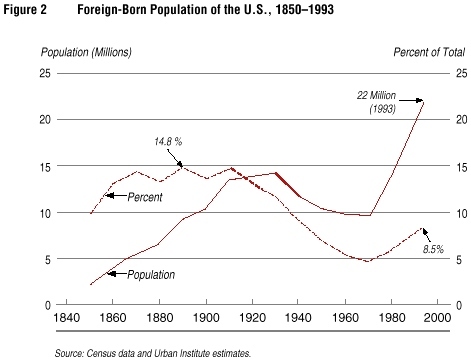 Yet, while the number of foreign-born persons in the United States is at an all-time high, the share of the population that is foreign-born—8 percent in 1990—is much lower than it was throughout the 1870-1920 period, when close to 15 percent of the total population (about 1 in 7 Americans) was born in a foreign country (Figure 2). The majority of the foreign-born living in the United States—over 85 percent—are in the country legally (Figure 3). Fully one-third are naturalized citizens and nearly half are legal permanent residents.9 Almost one-third of the 8.8 million legal permanent residents, about 2.8 million persons, were formerly illegal but attained legal status under the Immigration Reform and Control Act of 1986 (IRCA). Six percent of all foreign-born (1.1 million persons) entered the country as humanitarian admissions. Most of these do not remain in refugee and asylee status, but rather "adjust their status" to legal permanent residents as soon as they are eligible, which is one year after arrival. About 184,000 are currently in refugee status; 3,000-4,000 are in asylee status. The other foreign-born group living in the United States consists of undocumented immigrants. This group totaled about 2.5 million in 1990, roughly 13 percent of the immigrant population. ANNUAL FLOW Slightly more than 1.1 million immigrants arrive each year. About 700,000 are legal permanent residents, with family-based admissions accounting for almost three-quarters of this flow.11 Refugees and other humanitarian admissions add another 100,000-150,000 each year. Undocumented immigration contributes about 200,000-300,000 net additions annually, less than 30 percent of the immigrant flow. Immigrant admissions remained relatively constant through 1990 and then rose about 25 percent as a result of the 1990 Act. INS data on immigration are unclear on this point, however, leading to serious misperceptions of immigration levels on the part of the media and the public. In calculating total immigration, the INS counts IRCA legalizations in the legal immigrant totals at the point when those with temporary status convert to legal permanent resident status. As a result, the official figures on "immigrants admitted" erroneously appear to have tripled between 1987 and 1991 followed by a 50 percent drop in 1992 (Table 1). The IRCA group masks the actual trend, which is a steady, incremental rise in admissions. The net impact of immigrant arrivals is cushioned somewhat by two countervailing demographic forces. More than 200,000 foreign-born die each year in the United States; the majority are long-time U.S. residents. Roughly 200,000 former immigrants leave each year, reducing the net inflow and the size of the immigrant population; the emigrants are thought to come disproportionately from recent entrants. In sum, then, the foreign-born population grows by about 700,000 each year, due to the combination of entry (legal and illegal), exit, and death. Immigration accounts for about one-third of the country's net annual population growth. Source: INS, Statistical Yearbooks, 1985 through 1992. ILLEGAL IMMIGRATION TRENDS Several myths about undocumented immigrants continue to permeate the public debate, despite a decade of empirical research during which a great deal was learned about illegal immigration.12 These myths relate to the size of the immigrant population, their profile, and how they enter the country. In 1980 between 2.5 million and 3.5 million undocumented immigrants lived in the United States. About half were from Mexico; somewhat more than half were male; and about half lived in California. The best estimates suggest that the illegal population was growing by about 200,000 per year in the early 1980s (Bean, Edmonston, and Passel 1990; see especially chapters 1 and 9). These numbers are lower than estimates appearing in the popular press and substantially below the most widely publicized estimates used in determining the "costs" of illegal aliens. The perception of larger illegal flows and populations is driven by several "data" items, in particular the press accounts that quote INS figures on annual apprehensions along the the Mexico-U.S. border of more than 1 million people. Virtually all the INS apprehensions are temporary labor migrants who are caught more than once by the INS and who do not intend to live in the United States in any case. Many of these, were they not caught, would only stay in the United States for a day or two. A large reverse flow into Mexico goes virtually unnoticed and unreported. Only about one-third of the undocumented population is from Mexico (Table 2), with slightly fewer from Central America and the Caribbean. European and Asian countries also contribute significant numbers. Only 4 out of 10 undocumented aliens cross the border illegally or enter without inspection. Six out of ten undocumented immigrants enter legally—as visitors, students, or temporary employees—and become illegal by failing to leave when their visas expire. These people entered the country legally, have documents, and have been in contact with INS. CHANGING COUNTRIES OF ORIGIN Perhaps the most striking immigration trend has been the shift in primary sending countries resulting from the 1965 legislative changes. Of the countries sending legal immigrants to the U.S. in 1960 and 1990, the only country among the top ten in both years is Mexico (Table 3). In 1960, 7 of the 10 countries were European, and Canada was also on the list. In 1990, 6 of the top 10 sending countries were Asian. Canada no longer appeared, and the only European country on the list was the Soviet Union, principally because of its refugee flow. 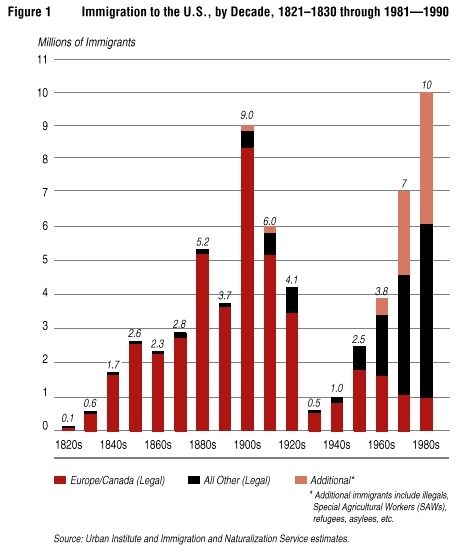 Europe, which accounted for two-thirds of legal immigrants in the 1950s, added only 15 percent in the 1980s (Figure 5). The increase in Asian immigration has been the most dramatic, up from 6 percent in the 1950s to 45 percent in the 1980s. 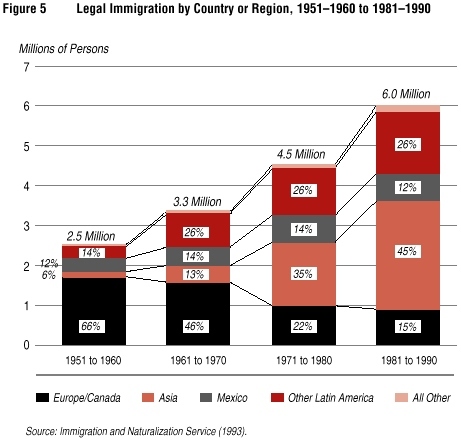 Latin America's share of legal immigrants increased from the 1950s to the 1960s, but not since then, although the absolute numbers have continued to increase. 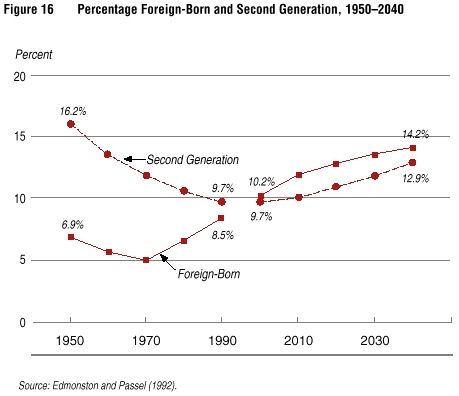 The changing countries of origin are reflected in the changing composition of the foreign-born population (Figure 6). Although the largest number of immigrants living in the U.S. are still of European/Canadian origin, that number is declining—in sharp contrast to Mexicans, other Latin Americans, and Asians, whose numbers have all virtually doubled in the last 10 years.14 More foreign-born residents are now Asian than are Mexican.15 The Philippines alone accounts for almost 1 million foreign-born residents, more than any single country except Mexico. Large numbers also come from Vietnam, China, Korea, and India—each contributing about half a million to the foreign-born population. INCREASING DIVERSITY Though the majority of new immigrants come from Latin America and Asia, steadily rising immigration, coupled with per-country limitations on legal flows, have increased the diversity of the immigrant population. The top 10 countries accounted for 65 percent of the legal immigrant flow in 1960, but only 52 percent in 1990 (Table 3). And the number of countries with at least 100,000 foreign-born residents in the U.S. increased from 20 in the 1970 census to 27 in 1980 to 41 in 1990. MORE RECENT IMMIGRANTS Compared to the rising trend in immigration to the United States in the 1980s, an extremely large number of immigrants has only recently arrived. 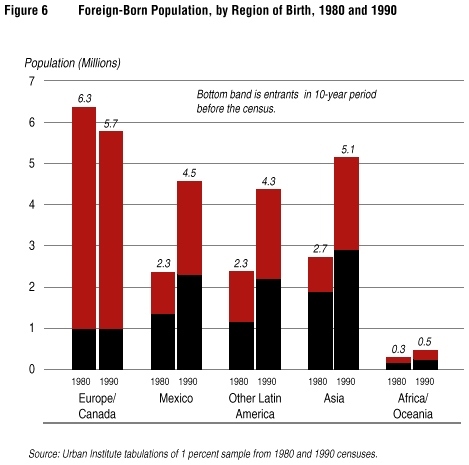 In 1990, 44 percent of the foreign-born had come in the previous 10 years. In 1970, the share of immigrants who had arrived in the previous decade was only 29 percent. The recent entry of so many immigrants tends to make foreigners more visible and distorts perceptions of how well immigrants generally are adapting to the United States. In fact, both English language ability and incomes tend to increase with time spent in the country. RACIAL AND ETHNIC COMPOSITION Shifts in immigrant origins are having a profound impact on the racial and ethnic composition of the country (Figure 7) (Passel and Edmonston 1992). In 1900, more than 85 percent of the U.S. population was white and non-Hispanic. By 1990, the white, non-Hispanic share of the population had dropped to 75 percent. The black share of the population, 12 percent, has not changed much over the century. 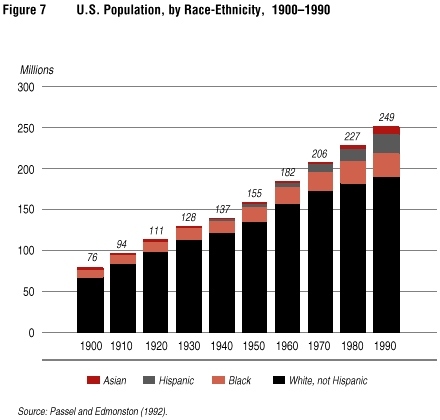 Both the Hispanic and Asian populations increased dramatically. The Hispanic population increased numerically 34-fold to 22 million in 1990, or from 0.9 percent of the population to 9.0 percent. A 30-fold increase in Asians to more than 7 million raised the Asian share of the total U.S. population from 0.3 percent in 1900 to 2.9 percent in 1990, still a small proportion of the total. Immigration affects the racial-ethnic composition of the U.S. population as a whole in two ways: directly through the addition of new people and indirectly through immigrants having children. Both the increased immigration and higher fertility rates among Hispanics and Asians have contributed to their increased shares of the population. Immigration's influence will continue to be felt on the U.S. population's composition through fertility, regardless of changes in admissions policies. WHERE DO IMMIGRANTS SETTLE? Throughout U.S. history, the majority of immigrants have settled in only a handful of locations in the United States, following friends and family who had gone there before. At the peak of the previous wave, about 57 percent of the foreign-born population lived in six states.17 Geographic concentration, a defining feature of contemporary immigration, is even greater today—a situation that complicates responses to immigration. States. Seventy-six percent of all immigrants entering in the 1980s went to only six states: California (which itself received almost four out of every ten), New York, Texas, Florida, New Jersey, and Illinois (Figure 8). An even larger share (85 percent) of undocumented immigrants lives in these six states. But although the share of immigrants going to other parts of the country remains small, the large and growing numbers of immigrants overall means that less-traditional gateway states and cities are also receiving increasing numbers of immigrants and acquiring sizable foreign-born populations. Massachusetts, for example, has over one-half million foreign-born residents, close to 40 percent of whom entered between 1980 and 1990. Even such traditionally "nonimmigrant" states as Georgia, North Carolina, and Minnesota have over 100,000 foreign-born residents, about half of whom entered in the last decade. Metropolitan Areas and Cities. The majority of immigrants settle in metropolitan areas. In 1990, 93 percent of the foreign-born population lived in metropolitan areas versus only 73 percent of natives. The impact of immigration on individual metropolitan areas can be profound. The Miami metropolitan area is 46 percent foreign-born; Los Angeles is 33 percent foreign-born; and Jersey City, which ranks third in the country, is 29 percent foreign-born. About half of all immigrants entering the United States during the 1980s live in eight metropolitan areas: Los Angeles, New York, Miami, Anaheim, Chicago, Washington D.C., Houston, and San Francisco. Immigration Impacts in the Context of Internal Migration. The potential demographic impact of immigrants varies considerably depending on whether an area is gaining or losing population independent of international migration. Out-migration to other states provides a "safety valve" against the pressures of foreign immigration. In-migration from other states may exacerbate tensions by adding to the population pressure and increasing the need for new capital expenditures. Thus, population growth and economic growth are critical elements in understanding the very different reactions of politicians and the populace in different parts of the country. 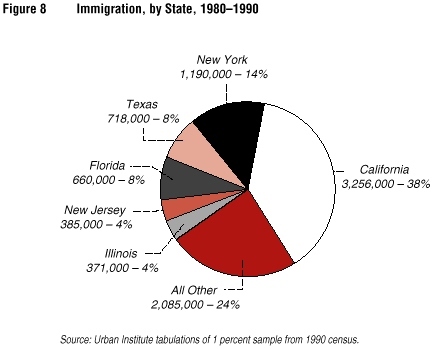 Although New York gained over 600,000 immigrants between 1985 and 1990, it actually lost population overall because 800,000 natives left (Figure 9). California, the focal point of much of the recent movement to restrict immigration, not only received more than twice as many new immigrants as New York but also had net in-migration of more than 200,000 from other parts of the United States. SOCIAL AND ECONOMIC INTEGRATION Some researchers have put forward the hypothesis that immigrant "quality"—as measured by education, ability to speak English, and skills—is declining. They argue that the new immigrants will not integrate as easily or move up the economic ladder as quickly as earlier immigrants, and will therefore place more strain on U.S. public resources. A review of recent data on social and economic characteristics of immigrants that affect immigrant integration calls this hypothesis into question. Limits of Source Data. One of the difficulties in understanding these issues is a data problem. Most data on the social and economic characteristics of immigrants come from the U.S. Bureau of the Census. While the census includes legal immigrants, refugees, and undocumented immigrants, it does not differentiate among these groups. This limitation must be kept in mind when examining immigrant characteristics, since they often differ by admission status. For example, incomes of illegal immigrants, formerly illegal immigrants, and refugees are much lower than those of other immigrants.18 Consequently, if census data are interpreted as including only legal immigrants, the data will portray them as being much worse off economically than they are. Aggregate data from the census would also then understate legal immigrants' human capital endowments and overstate their welfare use because they cannot be distinguished from illegal immigrants and refugees. This point is important, because policy options differ for each group, and proposals to "improve the quality of immigrants" are usually directed toward legal immigrants. English Language Ability. The ability to speak English well is important for social integration and economic mobility. It is also related to the likelihood that immigrants use welfare, and to the amount of taxes they pay. Because immigration reform over the past decade has increased not only the number but also the proportion of immigrants who have arrived recently, there has been a rise in the number of people who speak a language other than English at home, do not speak English well, or both. These trends are the result of the higher proportions of recent arrivals, not a reduced ability to integrate. There is no evidence that English language ability of immigrants is declining, once time in the United States is taken into account. The number of people who speak a language other than English at home grew by 37 percent—from 23.2 million to 31.8 million—between 1980 and 1990. The number who speak English "less than very well" (sometimes called the limited English proficiency, or LEP, population) grew at about the same pace, from 10.3 million in 1980 to 14.0 million in 1990. A dramatic rise in the LEP student population is another signal of the same trend. Between 1986 and 1991 the number of students counted who did not speak English very well grew by over 50 percent, compared to growth in the total student population of only 4 percent. What often goes unnoticed, however, is that over half of those who speak another language at home are native-born, and over one-third of the 14 million people who are LEP are native-born. The proportions of different immigrant groups who are LEP have remained constant or declined slightly since 1980 (Figure 10). The effects of immigration on language are felt nationwide but they are especially pronounced in urban regions. In the city of Los Angeles almost one-half of the population (1.8 million people) speaks a language other than English at home and over one-quarter does not speak English very well. Three-quarters of Miami's population and one-third of Houston's speak a language other than English at home. New York City has the largest LEP population of any city in the country, with 1.4 million LEP residents. Even in cities outside the major gateway states, rapidly growing newcomer populations can have a dramatic effect. In Milwaukee and Cleveland, 11 percent of the population now speak a language other than English at home. At the same time, new immigrants are learning English. About half the recent immigrants report speaking English "very well" or "well." One out of five of the foreign-born speaks only English at home; only one-quarter report speaking English "not well" or "not at all." The longer immigrants live in the United States, not surprisingly, the better their English becomes; and those who enter as children are more proficient as adults than those who enter later in their lives. It is also noteworthy that recent immigrants from Spanish-language countries become proficient in English at a greater rate than those from other non-English-language countries (Stevens 1994). Most immigrants either speak English or are learning to do so. Education. Immigrants are concentrated at the extremes of the educational spectrum in comparison with natives. They are much more likely than natives to have very low educational attainment. But they are also more likely than natives to have advanced degrees. In 1990, 26 percent of the foreign-born over age 25 had less than nine years of education compared to only 9 percent of the native population. 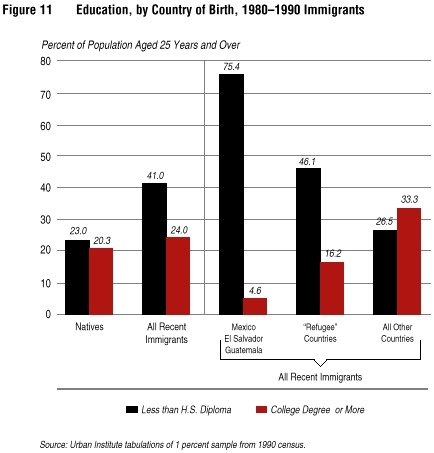 But 20 percent of both natives and immigrants have a college degree and recent immigrants (24 percent) are more likely than natives to have a college degree. Both immigrants and natives have made educational gains over the last decade, but natives have done so faster than immigrants. Since 1980 the share of immigrants with at least a high school diploma grew from 55 to 59 percent; for natives the increase was from 70 to 77 percent. Thus, the gap is growing despite increased levels of education among new immigrants. Country of origin makes a difference in educational attainment. At the low end of the range, 40 percent of immigrants from Latin America have less than nine years of education compared with 20 percent of European and Canadian and 15 percent of Asian immigrants. At the high end, 15 percent of Asian immigrants have advanced degrees versus 9 percent for European immigrants, 4 percent for Latin American immigrants, and 7 percent for natives. The wide educational differences among immigrants from different countries illustrate the problems with generalizing about immigrant quality from census data and drawing conclusions from them about reforming legal immigration policy. To gain some insight into these differences, Figure 11 divides recent immigrants (i.e., those entering during the 1980s) into three national-origin groups that are strongly related to immigrant status. The educational disparities are striking. Over 75 percent of recent immigrants from the major source countries for illegal immigrants have less than a high school diploma. This contrasts with the 46 percent of immigrants from refugee sending countries and only 26 percent from the third group of countries. At the same time, recent legal immigrants are much more likely to hold college degrees (33 percent) than natives (20 percent) or the other immigrant groups. Thus, the perceived low educational attainment or poor "quality" of recent immigrants, as well as the "hour-glass shaped" educational distribution, is directly attributable to illegal immigrants and refugees, not to legal immigrants. ECONOMIC PERFORMANCE An important component of immigrant integration into American society is their economic performance, that is, their employment, income, and occupation. When immigrants enter the labor force, they alter economic conditions for themselves and for natives. Thus, the descriptive statistics of immigrants' economic performance presented here provide background for the discussion of immigration's impacts on native workers in the next chapter. Labor Force Participation. As the immigrant population has grown larger, its impact on the labor force has increased. The share of the labor force that is foreign-born rose from 6.8 percent to 9.5 percent over the past decade. New immigrants (those entering during the 1980s) added almost 5 million people to the civilian labor force, representing 13 percent of new entrants but only 4 percent of the total labor force. Throughout the nineteenth century and first half of the twentieth century the number of immigrants coming to the United States rose and fell with the state of the U.S. economy. Changes in economic conditions do not appear to affect contemporary immigration levels as dramatically, despite economic declines that have hit immigrant workers in this country harder than natives. In 1980, for example, unemployment rates for native and foreign-born males aged 18 to 64 were almost equal, with immigrants doing somewhat better (5.8 percent unemployed versus 6.1 percent for natives). By 1990, after the economic downturn in the late 1980s, the unemployment rate had risen for immigrant men (to 6.4 percent), but had gone down slightly for native men (to 5.8 percent). Unemployment rates for women rose over the same period, but they rose more sharply for immigrant women (from 5.7 percent to 8.4 percent) than for native women (6.1 percent to 7.5 percent). At the lowest educational levels native men and women are more likely than immigrants to be without a job (i.e., not in the labor force or unemployed), but at the highest education levels the reverse is true (Figure 12). Occupations. The occupations of immigrants reflect their education, providing a mixed picture of how well they are doing in the U.S. economy. The two largest occupational groups for immigrants now are operators/laborers/fabricators and service workers—40 percent of all foreign-born work in those two occupation groups, compared with 30 percent for natives.21 Much of the difference can be explained by the greater representation of immigrant women in those occupations. Recent immigrants are even more heavily represented in these two occupation groups than immigrants who arrived before 1980, suggesting that immigrants gain skills and learn more about alternative job opportunities as they become accustomed to living in their new country. Immigrants are less likely than natives to have clerical, professional, and managerial jobs—25 percent of the foreign-born hold such jobs compared with 30 percent for natives. Again, the differential is greater for women than for men. Some of this difference may be due to language barriers as some employers may be unwilling to put non-native English speakers in positions that require contact with the public (Cross et al. 1990). But, while immigrants may be less likely to work as professionals than natives, the large proportion of highly educated immigrants entering between 1980 and 1990 has increased the number of foreign-born workers in professional, technical, and managerial occupations by 72 percent, compared with a 37 percent increase for natives. Length of time in the United States and immigrant status have dramatic effects on the incomes of immigrant households. For households headed by immigrants entering the U.S. before 1980, household income averages about $40,900 a year—almost 10 percent greater than native households. But income for households headed by immigrants who entered in the 1980s averages only $31,100. Much of this income difference between immigrants and natives appears to be attributable to the legal status of recent immigrant cohorts. Households headed by immigrants who entered during the 1980s from the major source countries for illegal immigration have average incomes of $23,900, 36 percent less than natives (Figure 13); even those who entered before 1980 fall 23 percent below natives. But recent immigrants from the major source countries for legal immigration have incomes falling only slightly below those of natives ($34,800). Those entering before 1980 have incomes 16 percent above those of natives ($43,200). The entrants from refugee countries tend to fall between the other two groups. (Here again, average household incomes of those from refugee countries who entered before 1980 exceed those of natives). Poverty Status: Rise in Poverty for Recent Immigrants. Notwithstanding the high average incomes of legal immigrants, one of the most striking trends over the past decade has been the increase in immigrant poverty. 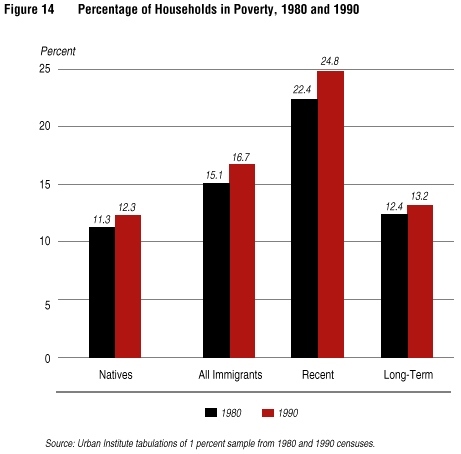 Household poverty increased for all groups between 1980 and 1990, but the increase was much greater for immigrant households than for native households. The number of native households in poverty grew by 11 percent while the number of poor immigrant households grew by 42 percent. And, a larger share of immigrant households than native households is in poverty—16.7 percent versus 12.3 percent (Figure 14). Again, this difference is attributable largely to recent immigrants. The poverty rate of immigrant households that entered before 1980 is less than one percentage point higher than those of natives. Concentrated poverty (i.e., residence within census tracts where 40 percent or more of the population is below poverty) is often used as a measure of severe need. The number of immigrants in concentrated poverty has grown roughly twice as fast as the number of natives during the 1980s. The percentage of the population in concentrated poverty areas that is foreign-born rose from 7.2 percent in 1980 to 10.1 percent in 1990. Overall Socioeconomic Attainment. In the aggregate, immigrants are less well off than natives on virtually all measures of socioeconomic status. However, data for immigrants who have been in the country for at least 10 years suggest that over time immigrants increasingly resemble natives. Furthermore, the recent immigrant group contains a substantial fraction of illegal immigrants, formerly illegal immigrants, and refugees—all groups with low average socioeconomic attainment. Immigrants admitted legally through employment and family preferences resemble natives much more than the "average" recent immigrant (a composite of legal and illegal recent immigrants) recorded in census data. And those legal immigrants who have been here since before 1980 are better off than natives on a variety of measures. The future is always uncertain. It is particularly so for immigration and immigrant flows, since legislation and global events can change the scale and characteristics of the immigrant flow at any time. But Urban Institute projections using demographic assumptions that are consistent with the 1990 Immigration Act provide some insight into likely future trends. These insights in turn are helpful for assessing a number of different aspects of the demographic future of the United States (Edmonston and Passel 1992). Particularly important to the utility of such projections is the distinction between the foreign-born population and their offspring. The immigrant generation usually speaks a language other than English as a first language and tends to retain fairly close ties with the ancestral country. History teaches us that the children of immigrants are the crucial generation for adaptation to American society. POPULATION SIZE AND GENERATIONAL COMPOSITION The overall U.S. population is projected to grow from 249 million in 1990 to more than 300 million by 2010 and to 355 million by 2040 (Figure 15). If immigration were completely halted after 1990, the projected population for 2040 would be 286 million. Thus, under current law, about 70 million post-1990 immigrants and their offspring will be added to the U.S. population over the next 50 years, accounting for almost two-thirds of the net population growth. Immigrants will also become a larger share of the total population over the next 50 years (Figure 16). The percent foreign-born (or first generation) in the population will increase steadily until about 2030, when it will level off at about 14 percent (about 1 in 7 Americans)—roughly the same level as in the late-nineteenth and early-twentieth century. The size of the second generation (i.e., the U.S.-born children of immigrants) has been decreasing relative to the U.S. population as a whole as the children of turn-of-the-century immigrants age. This trend will reverse very soon as the second generation begins to grow (the children of current immigrants). It will reach 45 million by 2040, at which time immigrants and their offspring combined will account for slightly more than 1 in 4 Americans (27 percent), versus about 18 percent today. RACIAL AND ETHNIC COMPOSITION—STATIC APPROACH Standard population projections assume that members of each racial or ethnic group belong to only one group and have children of that group. This static approach is employed in virtually all population projections. 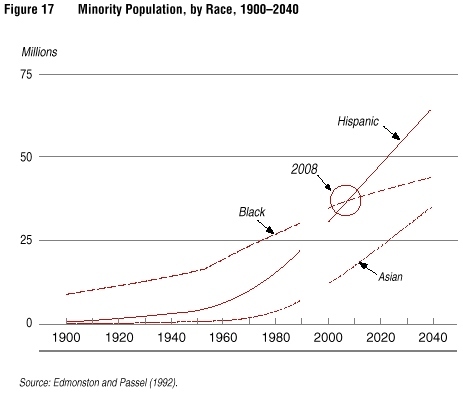 According to this scenario, minority populations in the United States will continue to grow over the next 50 years, with the Hispanic and Asian populations continuing their particularly rapid growth of the last several decades. 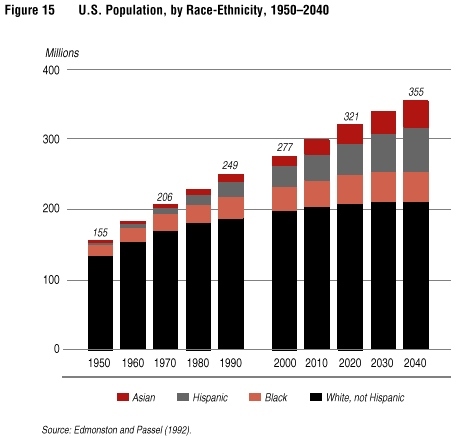 At current levels of immigration, the Hispanic population will exceed the African American population in about 15 years, becoming the largest minority population in the United States in that 15-year period (Figure 17). By 2040, the Hispanic population will reach 64 million, or 18 percent of the population; the Asian population will reach 35 million, or 10 percent. As a result of these trends, the composition of the population will continue to change (Figure 18). About 12 percent of the total population, and just under half the minority population, is currently African American. While African Americans will remain roughly 12 percent of the U.S. population for the next half century, the Asian and Hispanic shares will continue to increase. By 2040, about 40 percent of the population will consist of racial and ethnic minorities, but blacks will constitute less than one-third of the minority population. RACIAL AND ETHNIC COMPOSITION—IMPACT OF INTERMARRIAGE In projecting the future, this static approach does not take into account intermarriage and the concomitant increase in persons with ancestors of more than one racial or ethnic group. New methods developed by the Urban Institute show how intermarriage and changes in self-definition can affect the future size of racial-ethnic groups (Edmonston and Passel 1993). The group likely to be most affected by these trends is the Hispanic population, which has the highest rate of marrying outside their own group. If the offspring of Hispanic/non-Hispanic unions identify themselves to the census as non-Hispanic, the Hispanic population could be as small as 51 million in 2040 (14 percent of the population); if all identify themselves as Hispanic, this population could grow to 78 million (or 22 percent). For Asians, alternative assumptions regarding self-identification yield projections varying from 30 million (8 percent of the population) to 39 million for 2040 (or 11 percent). These projections show how fluid racial and ethnic identity can be in the United States. The impact of these changes will be felt throughout the age distribution, but for children and institutions serving them the projected changes will be especially noticeable. The total school-age population24 is projected to grow by over 20 percent, from 34 million in 1990 to 42 million in 2010. Well over half this growth will be children of immigrants (i.e., foreign-born children and native-born children with at least one foreign-born parent). 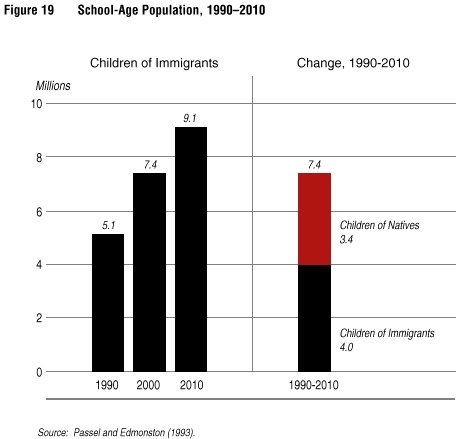 The number of children of immigrants will increase from 5 million to 9 million and represent about 22 percent of the school-age population (Figure 19). 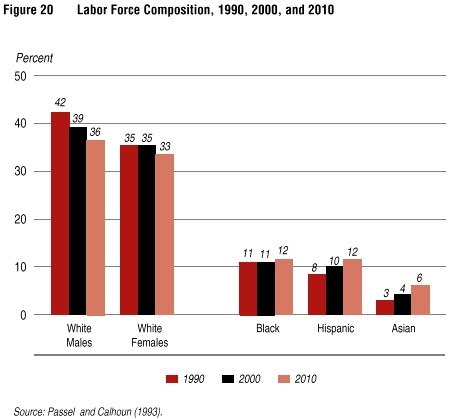 The composition of the labor force will also continue to change, with white, non-Hispanic male workers shrinking from 42 percent to 36 percent in 2010 (Figure 20). White males and females will still constitute a large majority (about two-thirds) of labor force entrants, but because they are relatively older than other groups, they will account for over 80 percent of those who leave the labor force through retirement and death. Thus, racial-ethnic minorities will increase from 22 percent of the labor force in 1990 to 26 percent in 2000, to 30 percent in 2010. The largest relative increases will be a doubling of Asian representation from 3 percent to 6 percent and an increase in Hispanics from 8 percent to 12 percent. SUMMARY Thus, we see steady, incremental growth in the size of the immigrant and racial-ethnic minority populations through the first half of the next century, along with a commensurate decrease in the relative size of the white majority population. However, the dimensions of these changes could be substantially altered depending on patterns of both intermarriage and ethnic self-identification. A concern that has appeared and reappeared at intervals throughout the history of U.S. immigration policy is the potentially negative impact of immigration on the employment and wage prospects of U.S. workers. The recession of the late 1980s and the jobless recovery of the early 1990s have brought this concern into new prominence. An enormous amount of research has, in fact, been done on the impact of immigration on the U.S. labor market, which adds up to a rather consistent picture. What follows is a survey of the major contributions to this literature—both aggregate statistical studies of the labor market and case studies of local labor markets and specific industries. There is no strong evidence that immigration reduces overall availability of jobs or wages. Immigrants may reduce the employment opportunities of low-skill workers, however, especially in areas where the local economy is weak and immigrants are concentrated. Immigration does not hurt the job prospects of African Americans as a whole, but it reduces their economic opportunities in areas of high immigration during recessionary periods. New immigrants appear to hurt the overall labor market chances of one population group—the immigrants who immediately preceded them. Immigration may also be altering the movement of native workers into and out of high-immigration areas. Immigrants contribute substantially to the U.S. economy. They create more jobs than they themselves fill. They do so directly by starting new businesses and indirectly through their expenditures on U.S. goods and services. Although some findings can be stated with great confidence, others must be stated more tentatively for a variety of reasons. Data Limitations: Available data are limited in important ways. Many of the most rigorous studies of immigrants' labor market effects use census data that are now one to two decades old. Further, it is important to acknowledge the fact that the 1990 census, like the 1980 census, was conducted when the economy was at or near its peak (i.e., in 1979 and 1989). Thus, the degree to which immigrants compete with native workers for the same jobs may be understated. In addition, as noted previously, U.S. census data do not differentiate among legal immigrants, refugees, and undocumented immigrants. Unmeasured Benefits: Little effort has been made to measure the benefits immigrants bring to the U.S. economy, such as the jobs generated by their demand for goods and services. Estimates of the costs of immigration rarely factor in immigrant spending as an important, offsetting benefit. Limitations of Aggregate Data: Aggregate statistical studies can yield reliable estimates of the effects of immigrants on the job market as a whole. But aggregate data may mask the impact of immigrants on particular industries or high-immigration areas, where their competitive effects may be greater. Limitations of Case Study Evidence: Case studies of particular industries can correct this possible bias by providing insights into employer attitudes and hiring practices through ethnographic as well as economic methods. But the evidence they generate about job displacement or wage effects is limited to the firms studied, generally immigrant-intensive firms. What happens in the larger population is "outside the frame," preventing case-study data from yielding results that are generalizable to regional or national markets. These caveats provide the necessary context for the more detailed findings that follow. The labor market studies cited below are described and summarized in Appendix B, Tables B-1 through B-7. To the extent that any displacement of natives by immigrants can be detected for the nation as a whole, the effects are trivial (Table B-1). Increasing the immigrant share of a local labor market from 10 to 20 percent, for example, produces declines in native labor force participation of less than 1 percent. What explains these results, which are so at odds with the tenor of much of the political debate today? First, aggregate studies take into account the employment-creating activity of immigrants, which is seldom noted in the debate. Second, recent immigrants may lack the English fluency, prior education, and work experience that are characteristic of U.S. workers. They may also need time to grasp the standards, discipline, and modes of production in a highly industrialized workplace. These patterns would tend to segment labor markets and insulate natives from direct competition with immigrants. There is also evidence, particularly in more recent work, that internal migration by natives to regions with high concentrations of immigrants is slower than outmigration from those regions, which may spread the effects of immigration and dampen direct competition (Walker, Ellis, and Barff 1992). Immigration has no discernible effect on wages overall, as a number of recent studies agree (Table B-2). Wage growth and decline appear to be unrelated to immigration—a finding that holds for both unskilled and skilled workers (Butcher and Card 1991). And a study of state-level wage declines over a 13-year period finds no evidence that immigration is a factor (Vroman and Worden 1992). Indeed, wage growth is no slower and may be faster where immigration rates are high than where they are low (Enchautegui 1993). Immigration has, on balance, contributed somewhat to the declining fortunes of low-skilled workers, according to the weight of the evidence (Table B-3), although the scale of the estimated effects varies from study to study. The largest estimates in the literature are not the effects of immigration alone, but of a combination of immigration and trade (Borjas, Katz, and Freeman 1991). Immigration may contribute to growth in wage inequality. For example, the President's Council of Economic Advisers recently reported that "immigration has increased the relative supply of less educated labor and appears to have contributed to the increasing inequality of income, but the effect has been small" (Economic Report of the President 1994). The Council's report concludes that "it seems unlikely that immigration could explain more than a few percent of the total change" in the expanding college-high school wage gap. Note, however, that the studies in Table B-3 do not differentiate immigrants according to legal status. Native African Americans in areas of high immigration fared better than native African Americans in low immigration areas in terms of wage and employment growth. In high-immigration areas, however, native African American wages do not keep pace with the rising wage trends that immigration brings for Anglos and Hispanics (Enchautegui 1993). Immigrants increase the labor market opportunities of African Americans in strong local economies but reduce them where labor demand is weak (Bean, Fossett, and Park 1993). Thus, increased immigration may hurt African Americans in recessionary periods and help them in periods of growth. This finding qualifies the results of two studies of high-immigration regions—New Jersey (Espenshade 1993) and Miami (Card 1990)—which found no effects. Immigration increases the percentage of the overall labor force that is employed but reduces the weekly earnings of less-skilled African American men and women (Altonji and Card 1991). Selected ethnographic studies find that employers prefer immigrants to native black workers, particularly in low-skilled jobs (Kirschenman and Neckerman 1991). They also find that employers rely on informal networks when looking for new hires in immigrant-dominated sectors of the economy. Use of immigrant networks reduces the employer's recruitment costs at the same time that it effectively excludes African Americans and other non-immigrants from the hiring process (Waldinger 1993). The group most clearly and severely disadvantaged by newly arrived immigrants is other recent immigrants who are, in the final analysis, the closest substitutes for newcomers. The uniformity of research results in this area is striking (Table B-5). A 10 percent increase in the number of immigrants reduces other immigrants' wages by 9 to 10 percent. The few labor market studies of illegal workers do not find dramatic impacts (Table B-6). Most studies that employ aggregate statistics report that undocumented immigration either has no effect on native workers or actually increases their labor market opportunities. The results of a number of prominent industry-specific case studies are summarized in Table B-7. The typical focus of such studies is displacement within a firm or industry rather than wage suppression. The majority find no more evidence of displacement than is revealed by the aggregate data. Even studies of more highly skilled occupations, (e.g. registered nurses), find no strong evidence of displacement (Levine, Fox, and Danielson 1993). EXPLANATIONS FOR THE FINDINGS A number of recurring themes help explain these outcomes. First, low-wage industries are segmented in a manner that assigns different positions to differing ethnic groups, immigrant groups, or both, thus mitigating displacement. For example, immigrants are concentrated in lower-paying non-union manufacturing and construction firms, while natives are concentrated in union firms (Morales 1983; Grenier et al. 1992). If competition between the non-union and unionized sectors of these industries leads to a contraction in the higher-wage union jobs, of course, the issue of displacement can no longer be examined using case-study techniques. Second, immigrant workers serve as flexible, low-wage workers in industries undergoing transition. These transitions could involve a shift from labor-intensive production processes to more capital-oriented processes, or relocation of production processes overseas. In either case, availability of immigrant workers makes possible continuing domestic operations that preserve jobs for other low-skilled native workers in the region (Waldinger 1985; Glaessel-Brown 1988). Third, immigrants in professional occupations have been viewed as providing labor that would not otherwise be available. This assumption is supported by a recent Urban Institute study that found no direct displacement of U.S. registered nurses and no wage differentials between natives and immigrants (Levine, Fox, and Danielson 1993). The authors caution, though, that reliance on foreign nurses may reduce efforts to train and recruit natives to available positions. They also note that in the long run the presence of foreign nurses may decrease the rate at which salaries increase and working conditions improve. Fourth, competition between immigrant and native workers is muted in periods of labor shortages but grows more intense in periods of labor surplus, a finding also supported by several studies based on aggregate data. Fifth, recruiting through immigrant networks rather than the broader labor market offers employers a number of advantages: It is cheaper; some informal training may occur before a worker starts the job; and the networks may exert informal social controls on the workers (Waldinger 1993; Greenwood and McDowell 1990). The disadvantage of this mode of hiring, as already noted, is its exclusion of African American and other natives from the hiring process. The overall impact of hiring through immigrant networks is ambiguous, however, because it tends to concentrate immigrants in a few industries—reducing the extent of competition with natives and potentially expanding natives' opportunities in other sectors. In sharp contrast to the comparatively developed literature on the impacts of immigrants on labor market opportunities of natives, the literature on the economic contribution of immigrants is sketchy. Little has been published in professional journals, and much of the work that has been done has not been replicated for verification. The following findings suggest that contributions of immigrants to the U.S. economy are substantial. Immigrants, as noted, create more jobs than they themselves fill and recent immigrants from abroad create as much employment growth as internal migrants from other areas of the United States (Enchautegui 1992). One source of the positive employment effects of immigration is the retention of industries that would otherwise have moved overseas. If no Mexican immigration to Los Angeles County had occurred between 1970 and 1980, for example, 53,000 production jobs, 12,000 high paying non-production jobs, and 25,000 jobs in related industries would have been lost (Muller and Espenshade 1985). Another source of job creation is the entrepreneurial activities of immigrants themselves. In 1990 almost 1.3 million immigrants (7.2 percent) were self-employed, a rate marginally higher than natives (7.0 percent). In addition, the longer immigrants are in this country the more likely they are to be self-employed. During the 1980s, immigrant entrepreneurship increased dramatically. In 1980, 5.6 percent of immigrants living in the United States were self-employed, but by 1990 the same group of pre-1980 immigrants (who had now been in this country for an additional decade) had a self-employment rate of 8.4 percent. Self-employment, as defined by the census, covers a wide range of possibilities—from a businessman or professional practitioner to a domestic worker, casual laborer, or someone who drives a gypsy cab. The evidence points to the self-employed as among the most economically successful of all immigrants. Average incomes for self-employed immigrants (slightly over $30,000 a year, according to the 1990 census) exceed those of all other classes of immigrant workers by a substantial amount and are about the same as the average incomes of native entrepreneurs. Furthermore, business ownership for ethnic minorities has been found to correlate well with rates of self-employment (Portes and Rumbaut 1990). Another way in which immigrants contribute to employment and overall economic growth is through their effect on aggregate demand for goods and services. Immigrants own and rent properties, as do natives; immigrants buy groceries, clothes, shoes, and the like. Their spending ripples though the economy, creating jobs and generating revenues for businesses and governments. A precise measure of the job-creating impact of immigrant spending has not been quantified, but the effect is clearly large. 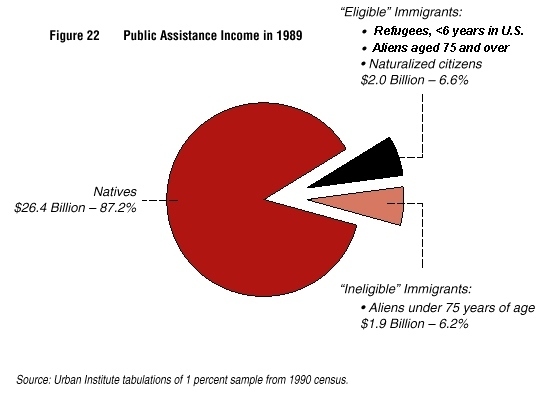 Total immigrant income in 1989—$285 billion according to the 1990 census—represented about 8 percent of all reported income, equal to immigrants' share of the population (7.9 percent). Even recent immigrants with their relatively low earnings had an aggregate income in 1989 of $80 billion. Much of this income is spent on U.S. goods and services. Immigrants also contribute in other ways to the U.S. economy, for instance, by attracting foreign capital to regions in which immigrants are concentrated (Miami, New York, Los Angeles) and by spurring technological innovation. Such contributions remain to be quantified. The public costs of immigrants—in particular their costs to the welfare system—are drawing increasingly critical attention as lawmakers seek to reduce the federal deficit and control public sector spending. Tension between the federal government and states and localities is also mounting under the fiscal pressures of tight state budgets and stagnant local economies in some high immigration areas, particularly California. State and local governments in several areas have argued that the federal government's right to control legal and illegal immigrant flows and to mandate state payments for cash welfare and Medicaid should carry with it the responsibility to provide sufficient financial support to cover immigrant costs. Adding further to the heat of this debate is a set of recent studies attributing enormous public costs to immigrants. These studies are widely cited in calls to restrict immigrants' access to public benefits, impose stricter immigration controls, and increase the federal revenues going to states. Because these studies have themselves become part of the debate, it is important to understand and correct their errors so that the policy debate can proceed on a firm factual basis. This chapter also focuses on the current debate regarding welfare and immigrants. Specifically, we investigate the degree to which immigrants actually receive welfare payments and examine potential impacts of some proposed welfare reforms. Contrary to the public's perception, when all levels of government are considered together, immigrants generate significantly more in taxes paid than they cost in services received. This surplus is unevenly distributed among different levels of government, however, with immigrants (and natives) generating a net surplus to the federal government, but a net cost to some states and most localities. This misperception regarding immigrants' net fiscal impact has been reinforced by several highly publicized recent studies that overlook three basic facts about immigration. First, integration of immigrants is dynamic; their incomes and tax contributions both increase the longer they live in the United States. Second, incomes vary considerably for different types of immigrants with legally admitted immigrants, as a group, generally having significantly higher incomes than illegal immigrants or refugees. Finally, the studies do not take into account the indirect benefits of job creation from immigrant businesses or consumer demand. One of the myths often cited to support the contention that immigrants cost more than they contribute is that they are heavy users of welfare. The facts are very different. When refugees are excluded, it becomes clear that immigrants of working age are considerably less likely than natives of working age to receive welfare. Refugees are explicitly entitled to such benefits on arrival and are, not surprisingly, much more likely than natives to be welfare recipients. Again, the failure to differentiate immigrants according to their legal status contributes greatly to misperceptions of reality and to proposals of potentially ineffective policies. There is no doubt that estimating the economic costs and benefits of immigrants is extremely difficult. The data required to develop direct estimates for local areas, states, or the nation are generally unavailable. Consequently, researchers must fill in the gaps with assumptions. There is nothing inherently biased about this exercise. But most current studies use assumptions that maximize the apparent costs of immigrants. Alternative assumptions—often more plausible—produce very different results. The body of literature available through 1991 paints a fairly consistent picture of the costs of immigrants across differing levels of government. Most national studies suggest that immigrants are not an overall fiscal burden on the native population. At the state level the picture is mixed, resulting in part from the differing responsibilities assumed by different state governments. At the local level, analyses completed in the 1970s and 1980s have invariably found immigrants to be a net fiscal burden. They found the same for native populations (Rothman and Espenshade 1992). Tax collections from immigrants are understated. Service costs for immigrants are overstated. Benefits of immigrant-owned businesses as well as the economic benefits generated by consumer spending from immigrants are ignored. Job displacement impacts and costs are overstated. Parallel computations for natives, which would show that natives are also net tax users, are not done. The size of the immigrant population—particularly the undocumented immigrant population—is overstated. The following discussion illustrates how much these types of errors can affect the estimates of immigrant public sector costs. Recent legal immigrants, immigrants granted legal status under the Immigration Reform and Control Act of 1986, and illegal immigrants and their U.S.-born children contributed $139 million in taxes to Los Angeles County according to a study conducted by the Los Angeles County Internal Services Division (ISD) (Los Angeles County 1992). At the same time, the study estimated that the county spent $947 million on services for the same population, leaving a deficit to the county of $808 million. The study also noted that only 3.2 percent of the taxes paid by this population went to the County, with the federal and state governments getting virtually all the rest. Fails to clarify that the county received a greater share of all taxes paid by these immigrants than it did of taxes paid by natives. Two studies of San Diego County by Rea and Parker (1992, 1993) rely on methods and assumptions that also overstate costs and underestimate revenues. For example, the studies assume that there are over 200,000 undocumented aliens in San Diego County—far more than can be supported by data. This figure would imply, by the authors' own reasoning, that there are over 4 million undocumented immigrants in California and 8 million to 12 million in the United States. The latter figure is between 5 and 9 million more than estimated by the INS. In addition, the revenue estimates for San Diego County omit several taxes (notably property taxes), underestimate other revenues, and base most estimates of service use levels—and costs—on small, nonrepresentative samples. According to the most controversial study of those discussed here, the benefits and costs of immigration to the United States in 1992 add up to a total net cost to all levels of government of $42.5 billion. This study, by Donald Huddle, was sponsored by the Carrying Capacity Network, a nonprofit group that advocates major reductions in immigration to the United States. "The Costs of Immigration" (Huddle 1993) uses estimation procedures that include a variety of errors. When these errors are corrected, the post-1970 immigrants in Huddle's study actually show a surplus of revenues over social service costs of at least $25 billion (Passel and Clark 1994). How did Huddle develop his estimates and why are they so wrong? REVENUE ESTIMATION ERRORS Three major errors affect Huddle's revenue estimates (Passel 1994). First, he generalizes from the wrong immigrant population. Huddle relies on the ISD study's income estimates for legal immigrants in Los Angeles County. The ISD estimates are for Los Angeles' legal immigrants who entered during the 1980s, but Huddle uses them to represent all legal immigrants who entered the United States during the period 1970-1992. The incomes of these groups, in fact, differ substantially. The assumptions underlying the ISD figures used by Huddle yield an average income estimate for legal immigrants entering L.A. County between 1980 and 1990 of about $9,700 a year. 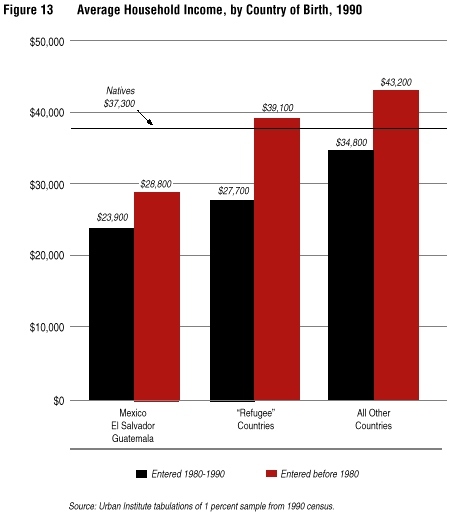 Census data for 1990 yield income estimates of legal immigrants entering the U.S. between 1970 and 1990 averaging more than $14,000 a year, or almost 45 percent more than the ISD estimates. Second, underestimating incomes leads inevitably to an understatement of the rates at which immigrants are taxed. Third, in addition to undercounting taxes paid, the study omits several significant revenue sources that are included in the ISD study—notably Social Security contributions, unemployment insurance, and gasoline taxes. These taxes all have large impacts on people who are in the low- and middle-income brackets—including most immigrants. $28.8 billion from omitting other taxes paid by immigrants (FICA , unemployment insurance, vehicle registration and fees, and state and federal gasoline taxes). Even this corrected estimate accounts for only a little over 80 percent of all taxes collected by all levels of government, because it omits corporate income taxes, local income taxes, commercial property taxes, utility taxes, and a number of other sources of government revenues. Since Huddle estimates a "net cost" for immigrants in 1992 of $42.5 billion, his underestimation of revenue by $50 billion more than offsets his entire net cost estimate. Within the context of his own methods, in other words, immigrants show a net surplus. A 50 percent overstatement of the size of the illegal population in estimating program participation and costs—$3 billion. Huddle's assessment of immigrant costs fails to take into account the impacts of programs on natives or society at large. The single largest component of immigrant-related public sector costs is the cost of providing public primary and secondary education, which is approximately $11 billion annually for immigrants. The actual recipients of these expenditures are, for the most part, native-born teachers, school administrators, maintenance staffs, and others employed in school administration, maintenance, and construction.27 In addition, the benefits realized by society from the additional education given to the immigrant children are not recognized in the analysis. INDIRECT IMPACTS OF IMMIGRATION In addition, contrary to the strong research consensus that immigrants have little overall impact on U.S. job opportunities, Huddle includes displacement costs of $12 billion for social services to natives who have permanently lost their jobs to immigrants. This result is based on Huddle's own, small-scale, limited studies in Houston and his misinterpretation of another study (Altonji and Card 1991). Huddle fails to include any estimate of the sizeable positive impacts of immigration already described. Those granted temporary protected status (TPS) under the Immigration Act of 1990 are barred from most federal benefit programs. Legal permanent residents are effectively barred from receiving most cash assistance during their first three years in the country, because their sponsor's income is "deemed" to be theirs during this period when determining eligibility for public benefits. They can also be deported as a public charge if they use public benefits during their first five years in the country. More important, use of public welfare makes it more difficult for immigrants to bring their relatives into the country, another relatively effective deterrent. To help enforce these restrictions on welfare use, IRCA mandated that the states adopt an automated verification system (the Systematic Alien Verification for Entitlements, or SAVE) to screen the immigration status of non-citizen applicants for AFDC and other federal benefit programs. The only major immigrant population eligible to participate broadly in the nation's welfare state from date of entry is refugees. Because they are fleeing persecution, their departure is unplanned, and they arrive often traumatized by war, there is a strong practical and ethical case for providing them support upon arrival. Even so, refugees represent only about 10 percent of new immigrants entering each year. The statistics on welfare use among immigrants reflect the effectiveness of these restrictions. Among non-refugee immigrants of working age who entered during the 1980s, 2.0 percent report welfare income versus 3.7 percent of working-age natives. This difference is quite substantial, particularly in light of the relatively low incomes of these recent immigrants.29 Among longer-term immigrants of working age, 3.2 percent are on welfare, still below the proportion of working-age natives on welfare. The two immigrant groups whose welfare use is high are refugees, as expected given their explicit eligibility and the circumstances of their arrival, and elderly immigrants who have arrived since 1980. More than 15 percent of refugees30 receive welfare (Figure 21). More than 25 percent of post-1980 elderly immigrants receive welfare, compared to about 7 percent of elderly natives. When these immigrants arrived in the U.S., they were already too old to build up a long enough work history to make them eligible for social security benefits. Elderly immigrants who have lived in the U.S. for at least 20 years are only slightly more likely to receive welfare than elderly natives (8.7 percent versus 6.9 percent, respectively). Newly available data show a large increase in alien recipients of Supplemental Security Income (SSI) since 1989. The total reached 601,000 in 1992, about 11 percent of all SSI recipients (Scott 1993). These data reinforce the picture of SSI as a substitute for retirement benefits among elderly immigrants arriving since 1980. Lawfully admitted aliens represent 25 percent of the aged SSI population, for example, but only 6 percent of nonelderly disabled recipients. For most (77 percent) of the elderly immigrants on SSI, this assistance is their only source of income. This is true for only one-third of elderly native recipients of SSI. About one-third of alien recipients applied for benefits shortly after the expiration of the three-year deeming period needed for resident aliens to qualify (Table 4). But over half applied after five or more years in this country. To reduce public costs, both Republican and Democratic members of the 103rd Congress have proposed welfare reform provisions to bar most legally resident aliens from receiving welfare. Although the proposals differ in details, their general approach would limit welfare costs by denying most public benefits to: (a) most permanent resident aliens, (b) parolees, (c) asylees, and (d) other "permanent residents under color of law (PRUCOL)." The plans would limit the period of eligibility for refugees to no longer than six years following their adjustment to permanent resident alien status. Generally, the proposals would, however, continue to make benefits available to legal immigrants over age 75. According to 1990 census data, natives receive 87.2 percent of all welfare income; immigrants account for the remainder, which amounts to $3.9 billion (Figure 22). Only about half of this ($1.9 billion or 6.2 percent of total payments) goes to the group that would be denied benefits. The other $2.0 billion in benefits to immigrants is split among naturalized citizens, recent refugees, and immigrants aged 75 and over (Figure 23). CBO's cost estimates have been derived from administrative records, which reinforces their validity. But some conceptual issues that are unaddressed by CBO's analysts could reduce the net savings that would, in fact, be realized. First, denying legally admitted immigrants public assistance may shift costs to state and local governments. This effect is likely to be felt particularly in the SSI program. Because it is largely federally funded, eligibility restrictions will generate little state or local savings, while applications for support by former SSI recipients under state or local general assistance programs could rise. Second, most of the cost savings of such a bar ($1.6 billion in 1990) would come from immigrants who have been in the country for more than five years (Figure 23). Virtually all these immigrants are eligible to naturalize and thus regain their eligibility to receive welfare. A ban on welfare receipt would give them a great incentive to exercise their citizenship rights. Further, the cut-off would occur at a time when the 3 million people who legalized under IRCA have become eligible to naturalize. This second large pool of applicants for naturalization could impose substantial demands on the institutional capacity of the INS. IS THE PAST ANY GUIDE TO THE FUTURE? The most frequently voiced concerns about today's immigrants fall broadly into two areas—anxiety over the integration of immigrants into American society and a focus on specific, perceived negative economic impacts. Calls for immigration reform that center on these issues often overlook the multiple purposes of U.S. immigration policy and the social, cultural, and moral goals that guide it. Narrow cost-benefit calculations usually fail to capture these aspects of immigration policy. Furthermore, the different domains of policy—legal immigration, humanitarian admissions, and illegal immigration—require their own policy responses. Reducing legal immigration and changing admission requirements for legal immigrants will not alter humanitarian flows or illegal immigration. Nonetheless, the economic and social objections must be addressed. Overall, immigrants pay more in taxes than they receive in public services. Average household incomes of legal and refugee immigrant households rise with time in the United States and surpass those of natives after ten years in this country. Immigrants generate more jobs than they take. Native job loss to immigrants is limited to labor markets where the economy is slack and immigrants are concentrated. Recent immigrants are substantially less likely to be on welfare than are natives. 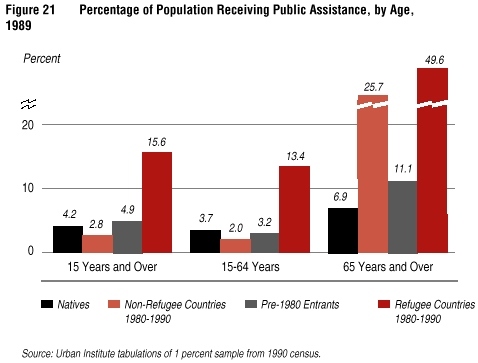 Welfare use among immigrants is concentrated among refugees and the elderly. If the past is any guide, therefore, the overall effects of immigration—even at today's high levels—will continue to be positive. But, of course, history does not always predict the future, and several trends in particular suggest caution in looking ahead. First, measures undertaken to control illegal immigration have been largely unsuccessful. The size of the illegal alien population is continuing to increase, even in areas with troubled local economies. Because undocumented immigrants are disproportionately poorly educated and low-skilled, they tend to have low incomes and place additional stress on local governments. Overall, the analysis here suggests that undocumented immigrants, not legal immigrants, are the ones likely to generate a negative fiscal impact. This, in turn, points to a need for altering the policies for controlling illegal immigration, not a need for major overhaul of the country's legal admissions policy. Furthermore, since the majority of illegal immigrants are not clandestine entrants across the southern border, but visa overstayers, increased border enforcement will clearly be insufficient to stop illegal immigration. Recent immigration raises other social and economic concerns that apply to the newcomer population as a whole. EDUCATION The educational distribution of all recent immigrants is shaped like an hourglass. Most immigrants enter with either a college degree or less than a ninth grade education. The educational attainment of natives, in contrast, is diamond shaped, concentrated in the middle of the educational spectrum. 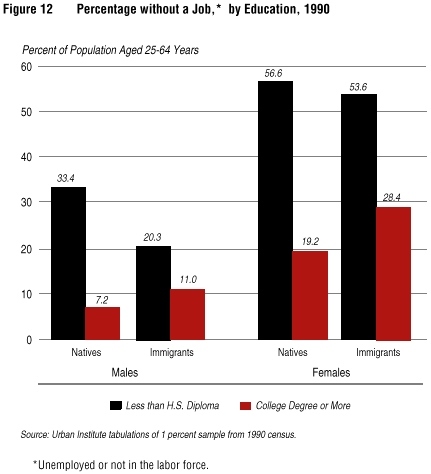 Thus, there are higher proportions of immigrants than natives at the bottom of the education range. While the overall education level of recent immigrants is rising, the average education level of natives is rising faster, widening the gap between natives and recent immigrants. This gap, however, is almost entirely attributable to undocumented immigrants and refugees, not legal immigrants. POVERTY The number of recent immigrants who are poor and live in concentrated poverty areas (geographic areas where 40 percent or more of the population is poor) has grown far faster over the past decade than comparable measures for natives. Again, refugees and undocumented immigrants are thought to largely account for this trend. 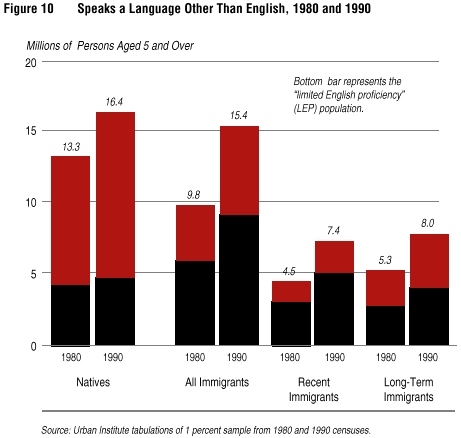 LANGUAGE Although the share of recent immigrants who do not speak English has not changed, their absolute numbers have grown as immigration has risen. FISCAL IMPACT When these trends are viewed in the light of the growing concentration of the immigrant population in six states and in the nation's already stressed urban areas, they raise serious questions about institutional capacity, fiscal fairness, and the direction of immigration policy. As already noted, most revenues from immigrants and natives alike flow to the federal treasury, whereas services are the responsibility of local (and state) governments. This disparity has intensified over the past decade, as federal support for the few federal programs targeted to immigrants and to the communities in which they settle has declined sharply. All of these concerns suggest that questions of intergovernmental fiscal equity—an important aspect of immigrant policy—require attention to ensure that the major contributions that immigration and immigrants have made to our society continue into the future. Questions also remain about the extent to which the national economy, as well as key regional economies, can generate the job growth required to support sustained high levels of immigration. Although there is no evidence to date of broad job displacement and the evidence regarding major wage effects is inconclusive, concerns have been raised about the impact of high levels of immigration on the growing wage inequality in the U.S. Further, falling travel costs and ease of communication may reduce the link between immigration levels and the performance of the economy that characterized previous waves of immigration, thereby creating increased competition for jobs in hard times. Alternatively, as some of the evidence reported here indicates, immigration may be a key factor in future job creation and improving the United States' competitiveness in an increasingly global economy. All told, though, these concerns and questions suggest the merits of monitoring the national, regional, and sectoral economic impacts of immigration. They also suggest the merits of exploring the feasibility of linking immigration policy more directly to specific economic measures, as is done in Australia and Canada. Such a link would enable admissions to increase when the economy is strong and decline when it is weak, thus reducing the competitive pressures of immigration sometimes felt in low-growth economic environments. The FY 1992 official figures on authorized and actual admissions for legal and humanitarian immigrants are shown, by category, in Table A-1. Some of them need explanation. The 700,000 per year figure for total "green card" entrants quoted in the text consists of total family immigration (520,000), employment preferences (140,000), and diversity immigrants (40,000). Humanitarian admissions and various miscellaneous categories are not included. The derivation of the 520,000 figure authorized for total family immigration and its two subcategories ("unlimited" immediate relatives of U.S. citizens and 226,000 admitted under other family categories) also merits explanation. The 520,000 can be exceeded because the 226,000 authorized for family preferences is specified as a "floor" rather than a ceiling and because all immediate relatives of U.S. citizens are admitted however many they may be. Thus, if over 294,000 immediate family members of U.S. citizens petioned for entry, the "ceiling" of 520,000 would be exceeded. Preference system categories are numbered to indicate descending order of preferences. Unused visas in category (1) are reallocated to category (2) and so on down the line. Sources: INS (1993), 1992 Statistical Yearbook; Fix and passel (1991). b. Unused visas in any preference category are reallocated to the next category below. c. The total number of principals (i.e., workers admitted for their skills or abilities) is 52,014, or 44.8 percent of the total. The balance represents members of their immediate families. Editor's Note: To read these tables it is important to bear in mind the distinction between percent and percentage point changes in population, employment, etc. Borjas (1986) 1980 census, SMSA level data 10 percent increase in the number of immigrants leads to .01 to .04 percent increase in male labor force participation and to .04 percent decline in female labor force participation. Sorensen et al. (1992) 1980 census, individual data and INS data Foreign-born share of the population has no statistically significant effect on number of weeks worked for natives; employment-preference immigrants negatively affect native white males. Simon, Moore, and Sullivan (1993) 1960-1977 INS immigration data and BLSc unemployment and labor force data No relation between city employment and immigration 1960 to 1977. Source: Urban Institute survey of the literature, 1994.
a. Standard Metropolitan Statistical Area. b. Between 1980 and 1990 the immigrant labor force increased from 6.7 million to 11.1 million -- an increase of 67 percent. The immigrant share of the labor force went from 6.7 percent to 9.4 percent, an increase of 2.7 percentage points. c. Bureau of Labor Statistics. Grossman (1982) 1970 census, SMSA data 10 percent increase in the number of immigrants is associated with 0.2 percent decline in wages. Borjas (1983) 1976 Survey of Income and Education Increased Hispanic share is associated with increased wages of African Americans (and, to some degree, whites). DeFreitas and Marshall (1983) 1970 and 1978 SMSA level data 10 percent increase in proportion foreign-born reduces manufacturing wages by 0.5 percent. Borjas (1987) 1980 census, individual level data All effects of immigrants on earnings of native men are small. Native whites adversely affected; native African Americans gain. Immigrants lower wages of other immigrants. Butcher and Card (1991) CPSa, 1979, 1980, 1988 and 1989, city level data Differentials in wage growth across cities unrelated to recent immigration for both low and highly skilled workers. Rivera-Batiz and Sechzer (1991) 1980 census, individual level data All effects of immigrants on natives are small. A 10 percent increase in the labor force from immigration is associated with a 1 percent decrease in wages for Mexican-Americans or 0.5 percent decrease for native whites. Vroman and Worden (1992) CPS data for 13 years (pooled) No evidence that immigration produces a decline in state level wages. Enchautegui (1993) 1980, 1990 CPS & 19980, 190 census, individual level data Wage growth is better in high versus low immigration areas. and Employment of Low-Skilled Workers? DeFreitas (1998) 1980 census, individual data Recent Immigrants have small positive effects on wages of Anglo men; negative effects on wages of African-American women. Insignificant effects on employment. Altonji and Card (1991) 1970 and 1980 census, SMSA data 10 percent increase in immigrant share of the population leads to a 2.4 percent decline in the share of low-skilled natives who worked in last year, a 12 percent decline in weekly earnings, but a 2.3 percent increase in the recent employment rate. Borjas, Katz and Freeman (1991) CPS data through mid-1980s 40 percent of decline in wages of less skilled workers due to combination of immigration and trade. Wages and Employment of African Americans? Muller and Espenshade (1985) 1980 census, 280 SMSAs No evidence that unemployment rate of African Americans is related to immigration as measured by percentage Hispanic. Borjas (1987) 1980 census, individual level data 10 percent increase in Hispanic immigrants increases wages of African Americans by 1.4 percent. DeFreitas (1988) 1980 census, individual level data An increase of 50 percent in the number of undocumented immigrants leads to a decline in wages of less-skilled African American women of 2 percent, and to a 5 to 6 percent decline in the weeks worked for African American men in "peripheral" industries; effects on Anglos are larger. Altonji and Card (1991) 1970, 1980 census, SMSA level data Immigration increases the share of the less-skilled African American labor force that is employed, but decreases weekly earnings; 10 percentage point increase in immigrants leads to 19 percent decline in earnings. LaLonde and Topel (1991) 1980 census, individual level data No effect of immigrants on African American men ages 16 to 34. Kirschenman and Neckerman (1991) Employer interviews in Chicago Employers express preference for immigrants versus African Americans. Rivera-Batiz and Sechzer (1991) 1980 census, individual level data Small effects on native blacks by all immigrant groups. The largest impact is a 1 percent decrease in wages of native blacks associated with a 10 percent increase in the labor force from Mexican immigration. Espenshade (1993) 1990 census, individual level data; New Jersey data Immigration has no labor market effects on native blacks. Bean, Fossett, and Park (1993) 1980 census, MSA level data Immigrants reduce employment opportunities for native blacks in weak labor markets but improve them in strong labor markets. Enchautegui (1993) 1980 and 1990 CPS, 1980 and 1990 census Native blacks in areas of high immigration fared better than native blacks in low immigration areas in terms of wage and employment growth. Waldinger (1993) Employer interviews in Los Angeles Employers hire from immigrant networks, resulting in effective discrimination against native white and black workers. on the Economic Opportunities of Earlier Immigrants? Borjas (1987) 1980 census, individual level data 10 percent increase in the number of immigrants reduces immigrants' wages by about 10 percent. LaLonde and Topel (1991) 1980 census, individual level data 10 percent increase in the number of immigrants reduces wages of recent immigrants by 9 percent. Taylor et al. (1989) 1980 census, individual level data Increases in the share of the undocumented lead to increases in wages and employment of non-Hispanic white males. Bean, Lowell, and Taylor (1988) 1980 census, individual level data Undocumented immigrants have little effect on Anglos, women, blacks, and native Hispanics. Winegarden and Khor (1991) 1980 census, individual level data 10 percent increase in the share of the undocumented population within a state increases the unemployment rate of young white workers by 1.3 percent. No effects found for any other group. Immigrants in Specific Industries and Locations? Morales (1983) Automobile, Los Angeles Concentration of undocumented immigrants in the non-union manufacturing firms; by implication mitigates competition with native workers concentrated in unionized firms. Mines and Martin (1984) Citrus, Ventura County, California Young, inexperienced and predominantly illegal Mexican migrants replaced an earlier group of legalized Mexican workers who had acquired benefits and seniority. Waldinger (1985) Apparel, New York Jobs retained in New York that would otherwise have been lost; some secondary job creation; as a result displacement limited. Bailey (1985) Restaurant, New York Immigrants do not compete with native African Americans because of segmentation of the labor force and unwillingness of employers to hire African Americans for positions filled by immigrants. Bailey (1987); Grenier et al. (1992) Construction, New York, Miami Displacement limited because immigrants are found in lower paid, non-union work; natives, including African Americans, in union work. Glaessel-Brown (1988) Textile, Lowell, Mass. No displacement. Columbian immigrants with skills not readily available worked for low wages, serving as transitional labor force, preserving jobs for less-skilled local textile labor. Back and Brill (1991) Poultry Processing, Georgia Employers consciously trying to replace native workers with Mexican immigrants who have lower turnover rates. Glaessel-Brown (1993) Electronics, Lowell, Mass. Competition between Cambodian and native workers depends on health of industry; when labor shortage no competition; when labor surplus, may be some competition with native workers, especially low-income minorities. Levine, Fox, and Danielson (1993) Registered Nurses, Miami Little evidence of direct displacement of U.S. registered nurses. Presence may decrease rate at which RN salaries increase and working conditions improve. Waldinger (1993) Multiple low-wage occupations, Los Angeles Hiring via immigrant social networks in combination with other mutually reinforcing changes in the labor market effectively exclude, if not displace, African Americans. 1 We distinguish here between immigrants who enter legally as permanent residents and those who enter legally for a specific purpose that will be accomplished during a temporary stay, such as tourists, students, or temporary workers. 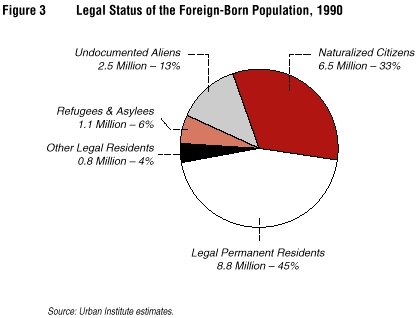 These "nonimmigrants," in the language of immigration law, enter the public policy debates in two ways: (a) the degree to which they displace native workers; and (b) the extent to which temporary immigrants who overstay their visas add to the undocumented immigrant population in the U.S.
2 See Appendix A for a detailed breakdown of legal and humanitarian admissions for FY 1992. 3 Only three other countries admit substantial numbers of immigrants who are eventually entitled to citizenship in a manner similar to the U.S. They are Canada, Australia, and Israel. 4 Each country is allotted an equivalent maximum number of visas per year (25,000). The actual number issued to residents of any individual country can vary, often exceeding this limit. It can do so for a number of reasons, the most important of which is the fact that there is no limit on the number of immediate family members of U.S. citizens who can enter annually. 5 The term "refugee" was brought into conformance with United Nations Protocol and Convention Relating to the Status of Refugees and was defined as a "person who is unwilling or unable to return to his country of nationality or habitual residence because of persecution or a well-founded fear of persecution on account of race, religion, nationality, membership in a particular social group, or political opinion" (emphasis added). The Act also removed refugees from the preference system and from the flow of legal immigrants to the U.S. Despite a professed interest in divorcing admissions from foreign policy concerns, geopolitical considerations dominated refugee policy through the end of the cold war. Ninety percent of all refugee admissions from 1945 through 1990 involved those fleeing communist countries. However, with the cold war's end, the influence of universal, neutral criteria and procedures, and not U.S. foreign policy interests, appear to be growing increasingly determinative both in refugee admissions and the outcomes of asylum determination cases (National Asylum Study Project 1993). 6 Of these 350,000 unadjudicated cases, 40,000 are the result of a single court decision that found Salvadoran and Guatemalan asylum applicants had been systematically denied due process in the 1980s (American Baptist Churches v. Thornburgh, 760 F. Supp. 796 [N.D. Cal. 1990]). The case reflects the broad, inclusionary due process protections extended on occasion by the federal courts to asylum applicants. 7 To date TPS has been granted to Bosnians, Salvadorans, Lebanese, Liberians, and Somalis. Members of these groups are entitled to remain in the U.S. and work until the attorney general declares that conditions have changed and they are to return to their homeland. Other blanket forms of relief from deportation are also available to aliens who have not been legally admitted to the United States so that they may remain temporarily or permanently. These include deferred enforced departure and extended voluntary departure. These statuses have been recently conferred upon Chinese, Salvadorans, Ethiopians, and Kuwaitis in the United States. 8 The strong family reunification imperatives built into U.S. immigration policy led to a small-scale follow-on to the legalization program. Following years of litigation, Congress enacted the family unity provisions of the 1990 Immigration Act, which authorized immediate family members of legalized immigrants also to adjust their status. This increased the number of amnesty beneficiaries by about 60,000. 9 The 1990 census counted 8 million naturalized citizens, but closer examination of the data reveal that a significant number of non-citizens reported that they are naturalized. For this reason, the authors estimate the true number of foreign-born who have naturalized to be about 6.5 million. Because of the waiting period required before naturalization, this figure means that more than half of those eligible to become U.S. citizens have done so. Currently, 200,000-300,000 persons naturalize every year. 10 Salvadorans who were granted temporary protected status by the 1990 Immigration Act were since granted deferred enforced departure (DED). Although only 80,000 of the 200,000 or so Salvadorans who were given temporary protected status have actually registered for DED, the rest are considered protected because the Immigration and Naturalization Service (INS) will not take any action to deport them. Others with limited legal status include persons paroled into the United States individually on humanitarian grounds, asylum applicants, and those awaiting adjustment of status. 11 The rest include employment-based or other economically driven admissions; "diversity" immigrants from countries underrepresented in recent flows; and humanitarian admissions such as Amerasian children. See Appendix A, Table A-1. 12 See Bean, Edmonston, and Passel (1990) for a discussion of research and perceptions regarding the size of the undocumented population before 1990. 13 Current estimates by Warren (1993) have the greatest credibility. These estimates rely on INS records for persons who enter the country legally and overstay their visas together with recent survey-based estimates of persons who enter illegally. 14 Note that the composition shown in the census data reflects illegal, as well as legal, immigration. 15 It is important to note that Asia, as defined here and by INS and the census, covers a broad range of countries, including the Middle East as well as the countries of south and east Asia noted in the text. 16 Race and ethnicity in recent U.S. censuses are based on self-identification. 17 The top six states for foreign-born population in both the 1910 and 1920 censuses were New York, Pennsylvania, Illinois, Massachusetts, New Jersey, and Ohio (1910) and Michigan (1920). 18 See, for example, the Los Angeles County study (Los Angeles County 1992). 19 The 11 countries are Afghanistan, Albania, Cambodia, Cuba, Ethiopia, Iraq, Laos, Poland, Romania, Soviet Union, and Vietnam. 20 Note that the recent immigrant population from Mexico in the census consists largely of people who come to the U.S. illegally. However, Mexico is also the largest supplier of legal immigrants. 21 Despite the prominent role of agriculture in many immigration debates, the number of immigrants in agricultural occupations is relatively small—313,000, or 2.6 percent of the immigrant labor force. Native-born Americans supply 1.7 million, which amounts to only 1.4 percent of the native labor force. 22 Income per person in immigrant-headed households is 21 percent less than in native-headed households. Immigrant households on average have more members than native households. The per capita income of immigrants actually exceeds that of natives ($14,488 versus $13,941). This comparison is particularly misleading, however, because native-born children of immigrants living in immigrant-headed households, who are supported by immigrants, are included in the native population. 23 These growth trends reflect low overall fertility, especially among native whites, and the continued aging of the population, notably the baby-boom generation. 24 For this discussion, the school-age population is approximated as persons aged 5-14 years. 25 These are projections of labor force supply based on demographic assumptions regarding population growth and trends in labor force participation. They do not take into account economic demand for labor or future job creation. 26 The accounting technique employed by ISD generates a large fiscal deficit for both immigrants and natives. This anomalous result occurs because close to 20 percent of the county's revenues were omitted from the study. 27 Further, the figures cited are based on the average costs of educating all children. Estimates of the marginal costs of educating immigrant children—i.e., the incremental additional expenditures made exclusively because of the presence of immigrant children—could either increase or reduce the $11 billion estimate. 28 Many undocumented immigrants are theoretically eligible to receive the Earned Income Tax Credit (EITC) because eligibility is conditional upon the duration and character of residence within the U.S., not legal status upon entry. However, because undocumented persons are unable to obtain a Social Security number, they may have practical problems filing their taxes and claiming their EITC credit. See generally, Drake and Miksch (1994). 29 Data are from the 1990 census where "welfare income" is defined as SSI, AFDC, or other public assistance or public welfare payments. For natives and immigrants alike percentages apply only to the population aged 15 and over. 30 We define the refugee group here as we did earlier—persons from the 11 specific countries who entered the U.S. during the 1980s. See note 19. 31 Two estimates of the costs of providing AFDC to the U.S.-born children of illegal immigrants have recently been released. The General Accounting Office reported that the total annual federal, state, and local costs of providing AFDC to these citizen children was $479 million (about 2 percent of total AFDC benefit costs). At the same time, the state of California has reported that the costs of providing AFDC in FY 1993 to the citizen children of illegal immigrants, in California alone, was $472 million. Obviously, GAO's estimate for California is substantially lower. The size—and costs—of this citizen child caseload are likely to rise if welfare reform bars their immigrant parents from receiving AFDC. Abowd, John M. and Richard B. Freeman (eds.) (1991). Immigration, Trade, and the Labor Market. Chicago: The University of Chicago Press. Altonji, Joseph G. and David Card (1991). "The Effects of Immigration on the Labor Market Outcomes of Less-skilled Natives." In Immigration, Trade, and the Labor Market, John M. Abowd and Richard B. Freeman (eds.). Chicago: The University of Chicago Press. Bach, R. and H. Brill (1989). "Shifting the Burden: The Impacts of IRCA and U.S. Labor Markets." Unpublished Interim Report to the Division of Immigration Policy and Research, U.S. Department of Labor, November. __________ (1991). Impact of IRCA on the U.S. Labor Market and Economy: Final Report to the U.S. Department of Labor. Institute for Research on Multiculturalism and International Labor Working Paper. Binghamton: SUNY. Bailey, Thomas R. (1985). "A Case Study of Immigrants in the Restaurant Industry." Industrial Relations, 24: 205-221. __________ (1987). Immigrant and Native Workers: Contrasts and Competition. Boulder, Co.: Westview Press. Bean, Frank D., Barry Edmonston, and Jeffrey S. Passel (eds.) (1990). Undocumented Migration to the United States: IRCA and the Experience of the 1980s. Washington, D.C.: The Urban Institute Press. Bean, Frank D., Mark A. Fossett, and Kyung Tae Park (1993). "Labor Market Dynamics and the Effects of Immigration on African Americans." In Blacks, Immigration, and Race Relations, Gerald Jaynes (ed.). New Haven: Yale University. Bean, Frank D., B. Lindsay Lowell, and Lowell J. Taylor (1988). "Undocumented Mexican Immigrants and the Earnings of Other Workers in the United States." Demography, 35 (1, Feb.): 35-52. Borjas, George J. (1983). "The Substitutability of Black, Hispanic, and White Labor." Economic Inquiry, 21(Jan.): 93-106. __________ (1986). "The Sensitivity of Labor Demand Functions to Choice of Dependant Variable." Review of Economics and Statistics, 68(1): 58-66. __________ (1987). "Immigrants, Minorities, and Labor Market Competition." Industrial and Labor Relations, 40(3): 382-392. __________ (1993). "Immigration and Ethnicity." NBER Reporter (Fall): 9-11. Borjas, George J., Lawrence F. Katz, and Richard B. Freeman (1991). "On the Labor Market Effects of Immigration and Trade." Working Paper. Washington, D.C.: National Bureau of Economic Research. Butcher, Kristin F. and David Card (1991). "Immigration and Wages: Evidence from the 1980s." Economic Impact of Immigration, 81(2): 292-296. Card, David (1990). "The Impact of the Mariel Boatlift on the Miami Labor Market." Industrial and Labor Relations Review, 43(2): 245-257. Clark, Rebecca L. and Jeffrey S. Passel (1993). How Much Do Immigrants Pay in Taxes? Evidence from Los Angeles County. Policy Discussion Paper PRIP-UI-26, Program for Research on Immigration Policy, The Urban Institute. Congressional Budget Office (1993). Unpublished data released by the Congressional Budget Office, September 21. Washington, D.C.: CBO. Cross, Harry, with Genevieve Kenny, Jane Mell, and Wendy Zimmermann (1990). Employer Hiring Practices: Differential Treatment of Hispanic and Anglo Job Seekers. Urban Institute Report 90-4. Washington, D.C.: The Urban Institute Press. DeFreitas, Gregory (1988). "Hispanic Immigration and Labor Market Segmentation." Industrial Relations, 27(2): 195-214. DeFreitas, Gregory and Adriana Marshall (1983). "Immigration and Wage Growth in U.S. Manufacturing in the 1970s." In Industrial Relations Research Association Series: Proceedings of the Thirty-Sixth Annual Meeting, Barbara D. Dennis (ed.). San Francisco. Drake, Susan B. and Karen J. Miksch (1994). "Immigrant Tax Issues and the Earned Income Tax Credit." 71 Interpreter Releases, 8 (Feb. 28): 275. Economic Report of the President (1994). Washington, D.C.: U.S. Government Printing Office, no. 14. Edmonston, Barry and Jeffrey S. Passel (1992). "The Future Immigrant Population of the United States." PRIP-UI-20, The Urban Institute, January. __________ (1993). "Exogamy and Race/Ethnic Ancestry in the U.S. Populations." Paper presented at the Winter Meetings of the American Statistical Association. Orlando, Fla. (Jan). __________ (eds.) (1994). Immigration and Ethnicity: The Integration of America's Newest Arrivals. Washington, D.C.: The Urban Institute Press. Enchautegui, María E. (1992). Immigration and County Employment Growth. Policy Discussion Paper PRIP-UI-23. Program for Research on Immigration Policy, The Urban Institute. __________ (1993). The Effects of Immigration on the Wages and Employment of Black Males. Policy Discussion Paper PRIP-UI-25. Program for Research on Immigration Policy, The Urban Institute. Espenshade, Thomas J. (1993). Immigrants, Puerto Ricans, and the Earnings of Native Black Males. Paper presented at the Population Association of America, 1993 Annual Meeting. Cincinnati, Ohio. Fix, Michael (ed.) (1991). The Paper Curtain. Washington, D.C.: The Urban Institute Press. Fix, Michael E. and Jeffrey S. Passel (1991). "The Door Remains Open: Recent Immigration to the United States and a Preliminary Analysis of the Immigration Act of 1990." Policy Discussion Paper PRIP-UI-14. Program for Research on Immigration Policy, The Urban Institute. Fix, Michael E. and Wendy Zimmermann (1993). After Arrival: An Overview of Federal Immigrant Policy. Immigrant Policy Program, Working Paper. The Urban Institute. Fuchs, Lawrence and Susan S. Forbes (1985). "Immigration and U.S. History—The Evolution of the Open Society." In Immigration Process and Policy, Thomas A. Aleinikoff and David A. Martin (eds. ), pp. 38-59. St. Paul, Minn.: West Publishing Co.
Glaessel-Brown, E. (1988). Immigration Policy and Colombian Textile Workers in New England. Report to the U.S. Department of Labor. Boston: Journeylines. __________ (1993). Cambodian Refugees and Colombian Immigrants in Lowell, Massachusetts: The Impact of Support Networks on the Adaptation and Incorporation of Newcomers. Report to the U.S. Department of Labor. Boston: Journeylines. Greenwood, M. J. and John M. McDowell (1990). The Labor Market Consequences of U.S. Immigration: A Survey. U.S. Department of Labor, Division of Immigration Policy and Research, Discussion Paper 4. Washington, D.C.: Bureau of International Affairs. Grenier, Guillermo J., Alex Stepick, Debbie Draznin, Aileen LaBorwit, and Steve Morris (1992). "On Machines and Bureaucracy: Controlling Ethnic Interaction in Miami's Apparel and Construction Industries." In Structuring Diversity: Ethnographic Perspectives on the New Immigration, Louise Lamphere (ed.). Chicago: The University of Chicago Press. Grossman, Jean Baldwin (1982). "The Substitutability of Natives and Immigrants in Production." The Review of Economics and Statistics, 64(4): 596-603. Hamel, Ruth and Tim Schreiner (1988). "Coors Courts Hispanics." American Demographics, 10(Nov.): 54. Huddle, Donald (1992). "Immigration and Jobs: The Process of Displacement." NPG Forum, (May): 6. __________ (1993). "The Cost of Immigration." Carrying Capacity Network. Revised July 1993. Washington D.C.
Immigration and Nationality Act (1992). Committee on the Judiciary, House of Representatives. 9th edition, reflecting laws enacted as of April 1, 1992, with notes and related laws. Immigration and Naturalization Service (various years). INS Annual Report. Washington, D.C.: U.S. Government Printing Office. __________ (various years). Statistical Yearbook of the Immigration and Naturalization Service. Washington, D.C.: U.S. Government Printing Office. Jones, Maldwyn Allen (1992). American Immigration, 2nd ed. Chicago: University of Chicago Press. Kirschenman, Joleen and Kathryn M. Neckerman (1991). "'We'd Love to Hire Them, But. . .': The Meaning of Race for Employers." In The Urban Underclass, Christopher Jencks and Paul E. Peterson (eds.). Washington, D.C.: The Brookings Institution. LaLonde, Robert J. and Robert H. Topel (1991). "Labor Market Adjustments to Increased Immigration." In Immigration, Trade, and the Labor Market, John M. Abowd and Richard B. Freeman (eds.). Chicago: The University of Chicago Press. Levine, Ruth, T. Fox, and S. Danielson (1993). Preliminary Findings from a Study of the Impact of the Immigration Nursing Relief Act of 1989. Unpublished. Washington, D.C.: The Urban Institute. Los Angeles County (1992). Impact of Undocumented Persons and Other Immigrants on Costs, Revenues and Services in Los Angeles County: A Report Prepared for Los Angeles County Board of Supervisors. Los Angeles County, Internal Services Division. Mines, Richard and Philip L. Martin (1984). "Immigrant Workers and the California Citrus Industry." Industrial Relations, 23(1): 139-149. Morales, R. (1983). "Transitional Labor: Undocumented Workers in the Los Angeles Automobile Industry." International Migration Review, 17(4): 570-596. Muller, Thomas and Thomas J. Espenshade (1985). The Fourth Wave. Washington, D.C.: The Urban Institute Press. National Asylum Study Project (1993). An Assessment of the Asylum Process of the Immigration and Naturalization Service. Harvard Law School, Immigration and Refugee Program, September. Passel, Jeffrey S. (1994). "Immigrants and Taxes: A Reappraisal of Huddle's 'The Cost of Immigrants.'" Policy Discussion Paper PRIP-UI-29, Program for Research on Immigration Policy. The Urban Institute. Passel, Jeffrey S. and Rebecca L. Clark (1994). "How Much Do Immigrants Really Cost? A Reappraisal of Huddle's 'The Cost of Immigrants.' " Manuscript. Washington, D.C.: Urban Institute, February. Passel, Jeffrey S. and Barry Edmonston (1992). "Immigration and Race: Recent Trends in Immigration to the United States." Program for Research on Immigration Policy Paper PRIP-UI-22, The Urban Institute. Forthcoming in Immigration and Ethnicity: The Integration of America's Newest Arrivals, Barry Edmonston and Jeffrey S. Passel (eds.). Washington, D.C.: The Urban Institute Press. Portes, Alejando and Ruben G. Rumbaut (1990). Immigrant America: A Portrait. Berkeley: University of California Press. Rea, Louis M. and Richard A. Parker (1992). Illegal Immigration in San Diego County: An Analysis of Costs and Revenues. San Diego: Rea & Parker, Incorporated. Report to the California State Senate Special Committee on Border Issues. __________ (1993). A Fiscal Impact Analysis of Undocumented Immigrants Residing in San Diego County: Costs and Revenues of Significant State and Local Government Programs. San Diego: Rea & Parker, Incorporated. Report to the Office of the Auditor General. Rivera-Batiz, Francisco L. and Selig L. Sechzer (1991). "Substitution and Complementarity between Immigrant and Native Labor in the United States." In U.S. Immigration Policy Reform in the 1980s: A Preliminary Assessment, Francisco L. Rivera-Batiz, Selig L. Sechzer, and Ira N. Gang (eds.). New York: Praeger. Rothman, Eric S. and Thomas J. Espenshade (1992). 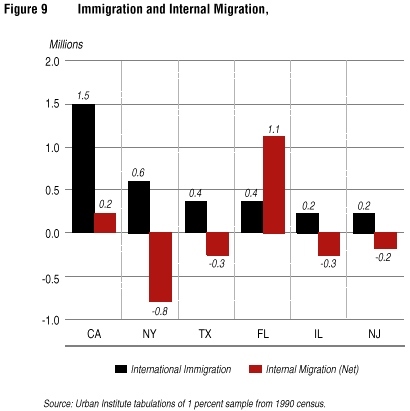 "Fiscal Impacts of Immigration to the United States." Population Index, 58(3): 381- 415. Scott, Charles (1993). "SSI Payments to Lawfully Resident Aliens." Office of Supplemental Security Income. Manuscript. Simon, Julian, Stephen Moore, and Richard Sullivan (1993). "The Effect of Immigration on Aggregate Native Unemployment: An Across-City Estimation." Journal of Labor Research, 14(Summer): 299-316. Sorensen, Elaine, Frank D. Bean, Leighton Ku, and Wendy Zimmermann (1992). Immigrant Categories and the U.S. Job Market: Do They Make a Difference? Urban Institute Report 92-1. Washington, D.C.: The Urban Institute Press. Stevens, Gillian (1994). "Immigration, Emigration, Language Acquisition, and the English Language Proficiency of Immigrants in the United States." Forthcoming in Immigration and Ethnicity: The Integration of America's Newest Arrivals, Barry Edmonston and Jeffrey S. Passel (eds.). Washington, D.C.: The Urban Institute Press. Taylor, Lowell J., Frank D. Bean, James Rebitzer, Susan Gonzalez Baker, and B. Lindsay Lowell (1988). Mexican Immigrants and the Wages and Unemployment Experience of Native Workers. Policy Discussion Paper PRIP-UI-1. Program for Research on Immigrant Policy, The Urban Institute. Vroman, Wayne and Kelleen Worden (1992). "Immigration and State-Level Wage Adjustments in the 1980s." Manuscript. Washington, D.C.: The Urban Institute. Waldinger, Roger (1985). "Immigration and Industrial Change in the New York City Apparel Industry." In Hispanics in the U.S. Economy, George J. Borjas and Marta Tienda (eds.). Orlando, Fla: Academic Press, Inc.
__________ (1993). Black/Immigrant Competition Re-assessed: New Evidence from Los Angeles. Unpublished. Los Angeles: UCLA, Department of Sociology. Walker, Robert, Mark Ellis, and Richard Barff (1992). "Linked Migration Systems: Immigration and Internal Labor Flows in the United States." Economic Geography, 92 (68 ): 234-248. Warren, Robert (1993). 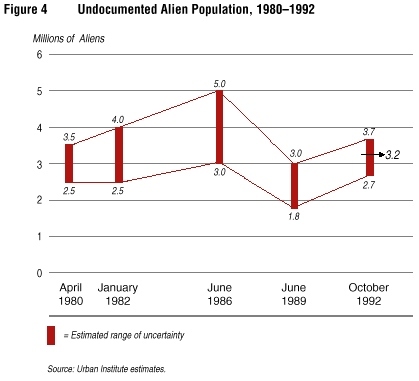 "Estimates of the Resident Illegal Alien Population: October 1992." Immigration and Naturalization Service, August. Winegarden, C.R. and Lay Boon Khor (1991). "Undocumented Immigration and Unemployment of U.S. Youth and Minority Workers: Econometric Evidence." The Review of Economics and Statistics, 73(1): 105-112. Winnick, Louis (1990). New People in Old Neighborhoods: The Role of Immigrants in Rejuvenating New York's Communities. New York: Russell Sage Foundation. Yale-Loehr, Steven (1991). Understanding the Immigration Act of 1990: A Practical Analysis. Washington, D.C.: Federal Publications. The authors wish to thank Ruth Levine and Marcus Stanley for their contributions to earlier versions of this volume; Bill Gorham for his support and guidance; Susan Brown, Sarah Ingram, Susan Forbes Martin, Max Singer, and Freya Sonenstein for helpful comments and suggestions; Scott Forrey, Felicity Skidmore, and Karen Wirt for their expert editorial assistance; Francesca Moghari for her skilled work on layout and design; Nolan Malone and Rosalind Berkowitz for research assistance; and Barbara Willis and Sheila Lopez for production assistance. The Urban Institute's Immigrant Policy Program was created in 1992 with support from the Andrew W. Mellon Foundation. The overall goal of the program is to research, design, and promote policies that integrate newcomers into the United States. To that end, the program seeks to: 1) Develop systematic knowledge on immigrants' economic mobility and social integration, and the public policies that influence them; 2) Disseminate knowledge broadly to government agencies, nonprofit organizations, scholars, and the media; and 3) Advise policymakers on the merits of current and proposed policies. The Program for Research on Immigration Policy was established in 1988 with initial core support from The Ford Foundation. The program is dedicated to supporting the formulation of immigration and immigrant policies at the state and national levels and in relevant areas of the private sector. It has three basic goals: 1) To study the important domestic and international issues raised by the Immigration Reform and Control Act (IRCA) of 1986 and the Immigration Act of 1990; 2) To address the larger, continuing questions and problems of immigration and immigrant policy; and 3) To disseminate and exchange information about immigration and immigrant policy through publications and conferences. Edmonston, Barry, and Jeffrey S. Passel (eds. ), Immigration and Ethnicity: The Integration of America's Newest Immigrants, Washington, D.C.: The Urban Institute Press, forthcoming 1994. Stanley, Marcus, Diane August, Michael Fix, and Jeffrey S. Passel, "Emergency Immigrant Education Act: Conference Report," Immigrant Policy Program, September 1993. 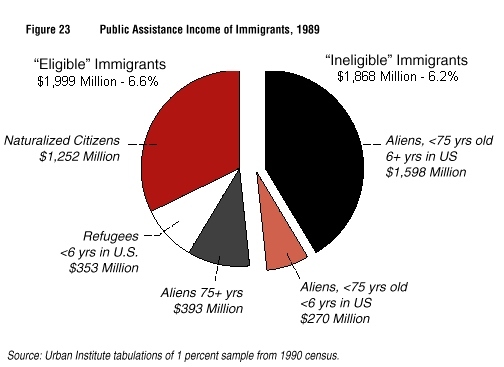 Passel, Jeffrey S., "Immigrants and Taxes: A Reappraisal of Huddle's 'The Cost of Immigrants'," Program for Research on Immigration Policy Paper PRIP-UI-29, The Urban Institute, January 1994. $9.50 #4911. Clark, Rebecca L. and Jeffrey S. Passel, "How Much Do Immigrants Pay in Taxes? Evidence from Los Angeles County," Program for Research on Immigration Policy Paper PRIP-UI-26, The Urban Institute, August 1993. $9.00 #5130. Fix, Michael and Wendy Zimmermann, "After Arrival: An Overview of Federal Immigrant Policy in the United States," Immigrant Policy Program, June 1993. $9.50 #5163. Zimmermann, Wendy, and Michael Fix, "Immigrant Policy in the States: A Wavering Welcome," Immigrant Policy Program, June 1993. $8.50 #5164. Enchautegui, María E., "The Effects of Immigration on the Wages and Employment of Black Males," Program for Research on Immigration Policy Paper PRIP-UI-25, The Urban Institute, May 1993. $8.50 #5118. Enchautegui, María E., "Immigration and County Employment Growth," Program for Research on Immigration Policy Paper PRIP-UI-23, The Urban Institute, August 1992. $8.50 #4880. Fix, Michael, and Jeffrey S. Passel, "The Door Remains Open: Recent Immigration to the United States and a Preliminary Analysis of the Immigration Act of 1990," Program for Research on Immigration Policy Paper PRIP-UI-14, The Urban Institute, January 1991. $8.50 #3914.